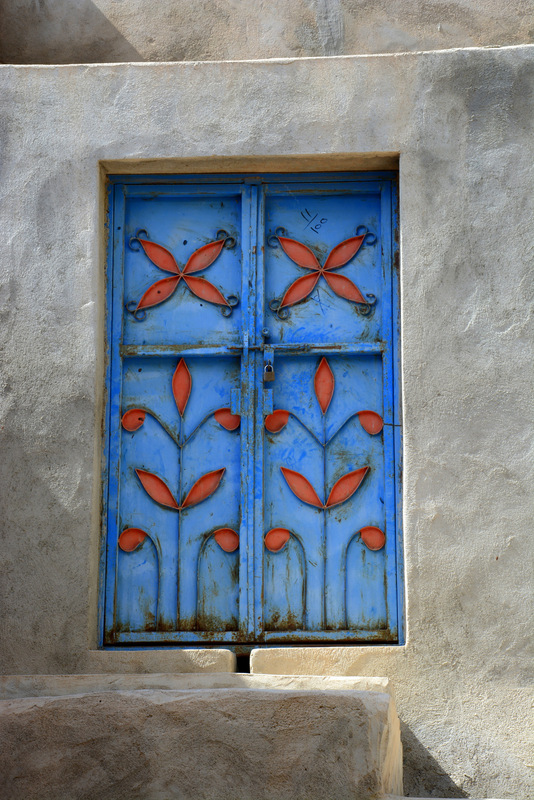 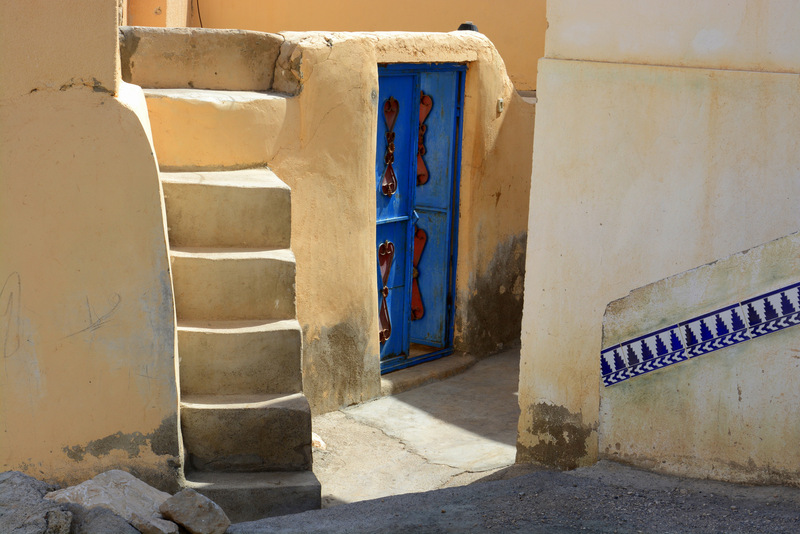 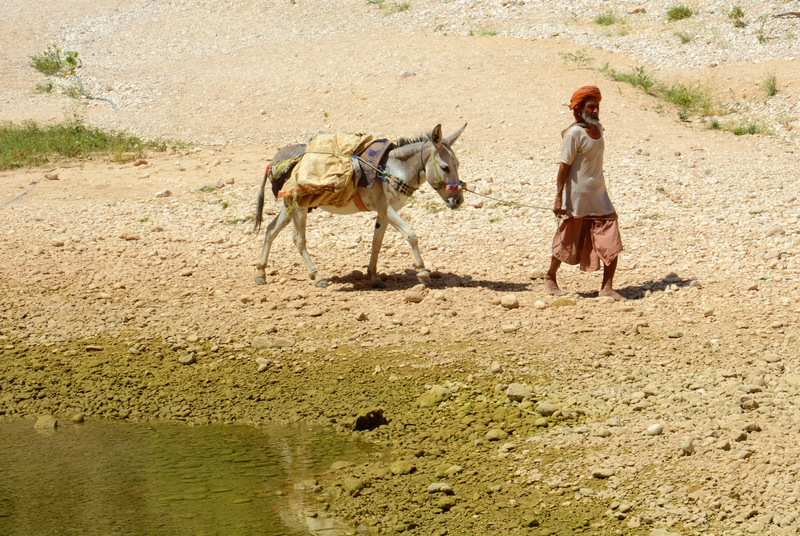 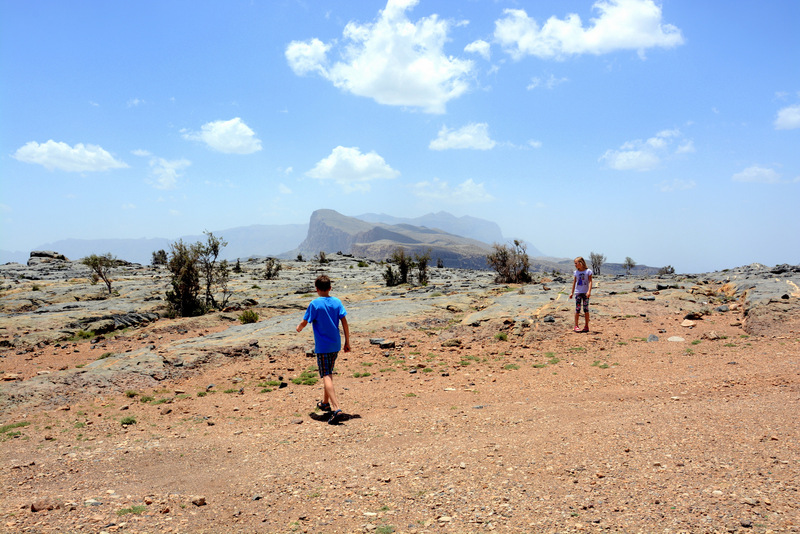 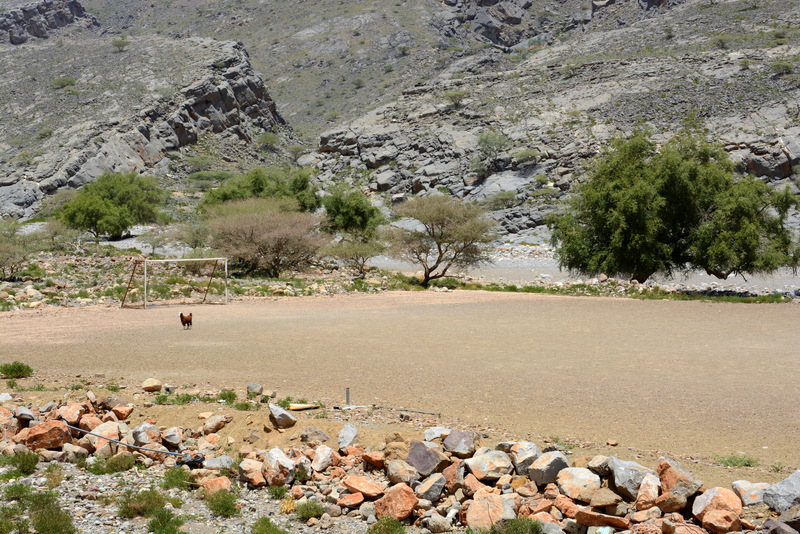 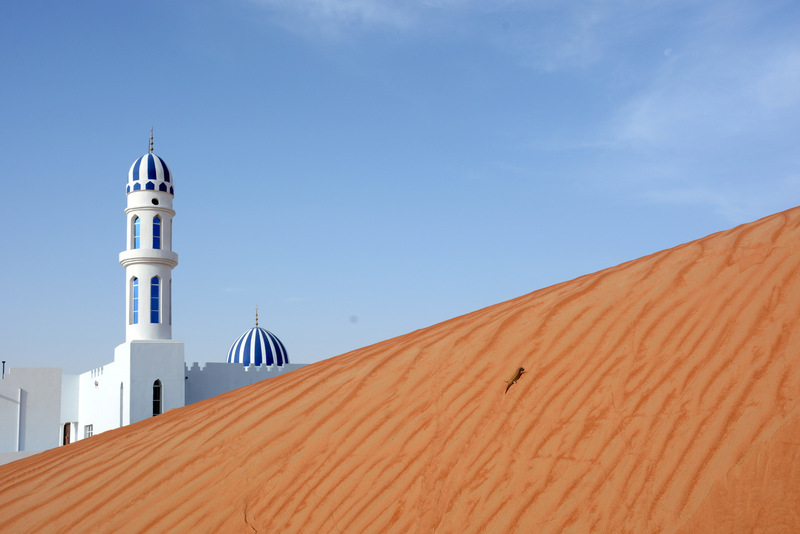 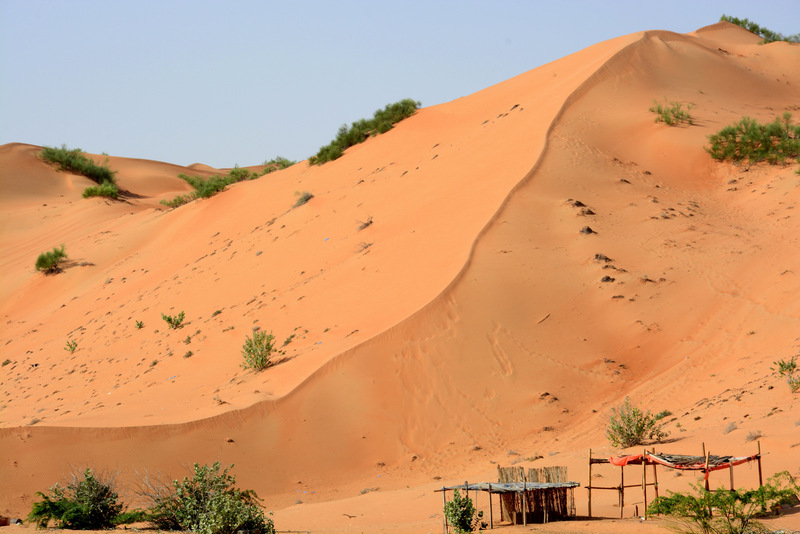 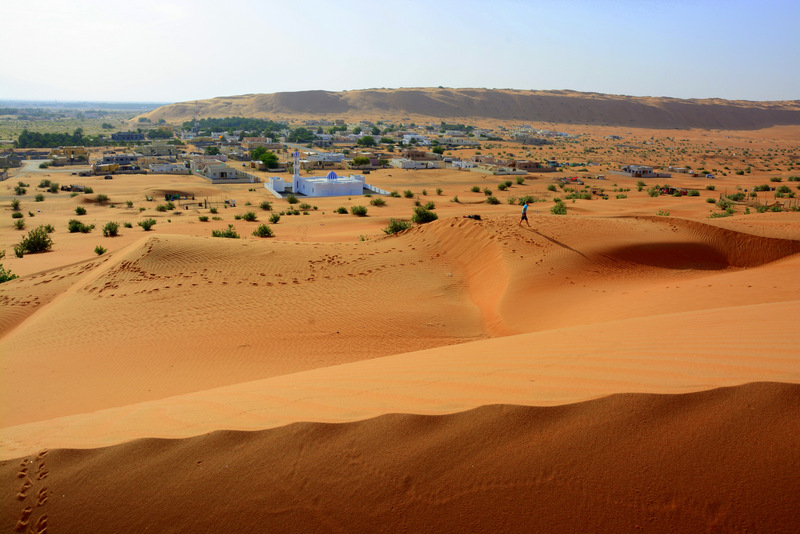 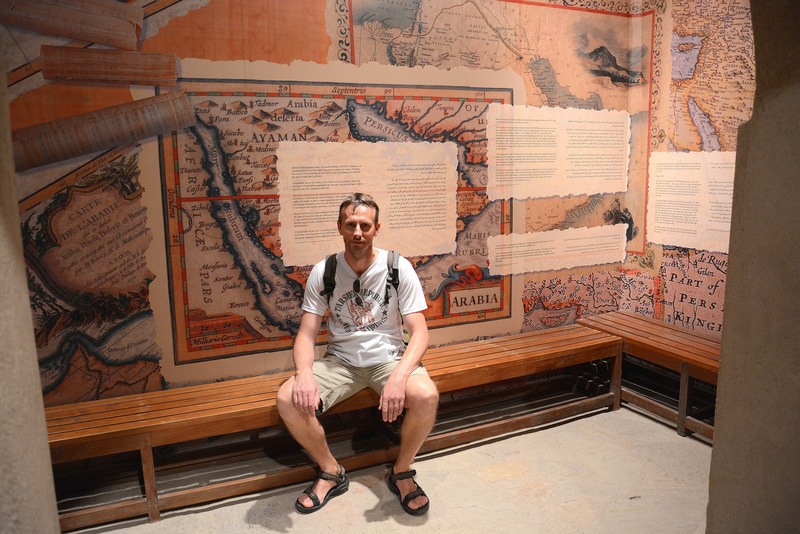 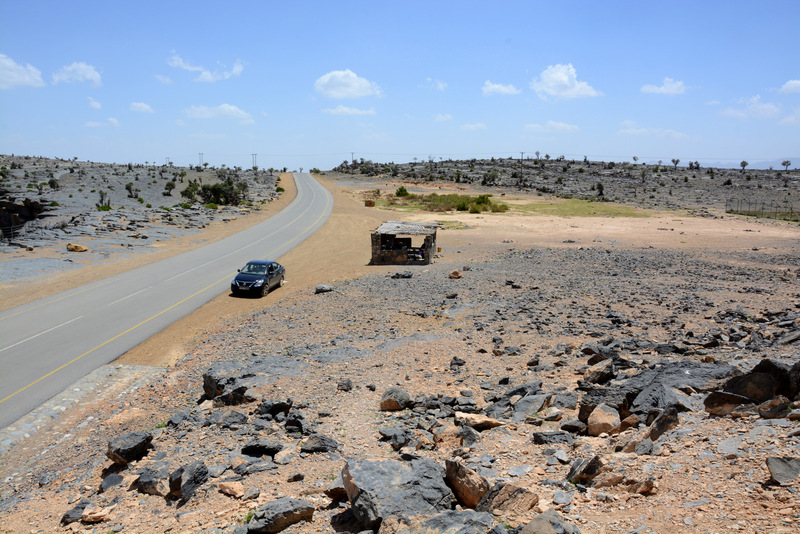 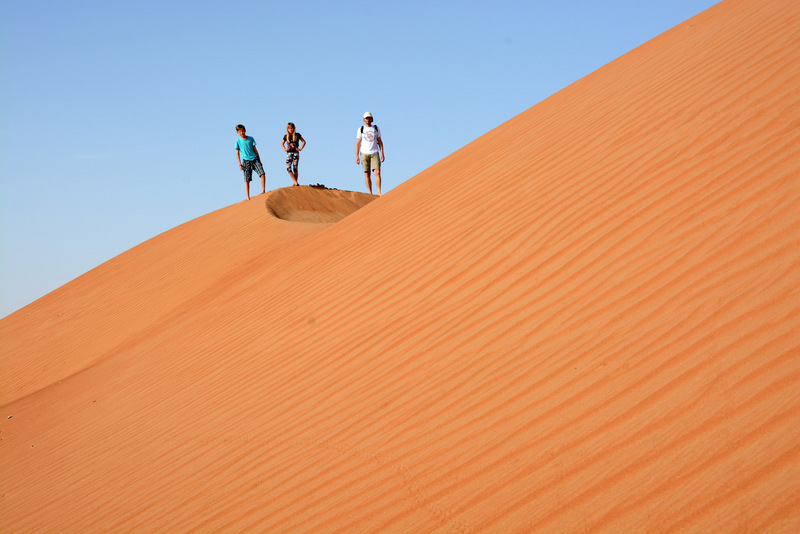 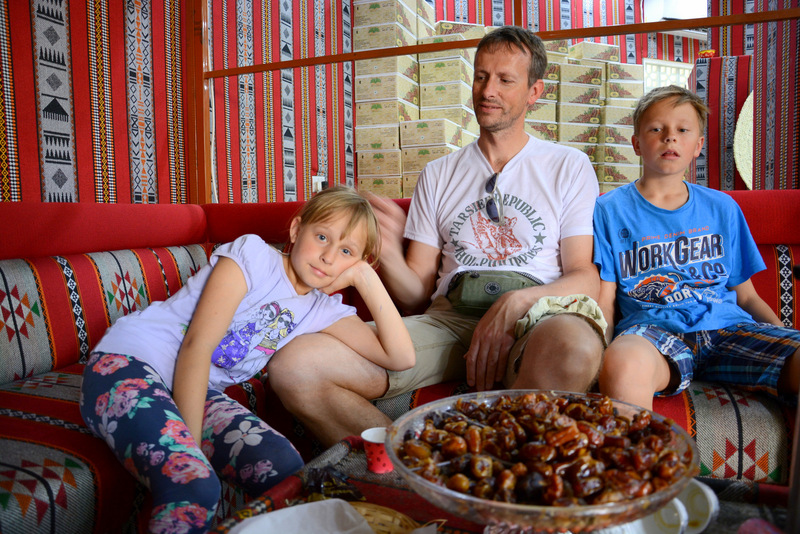 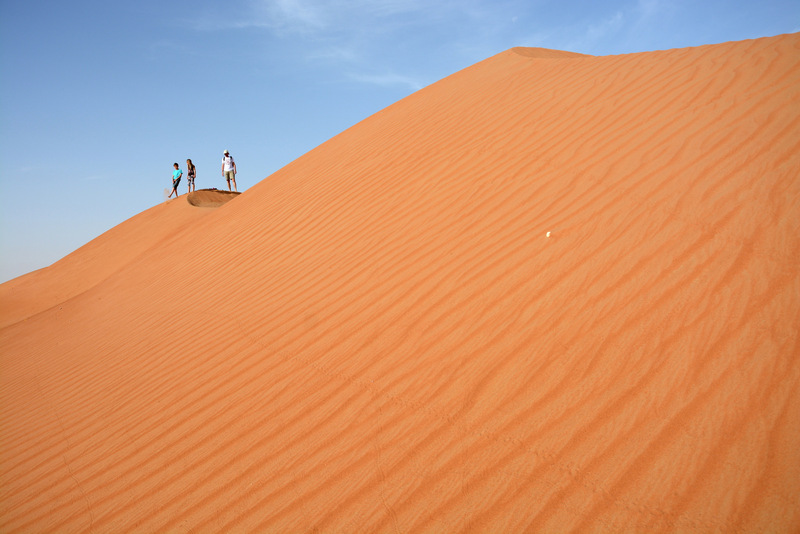 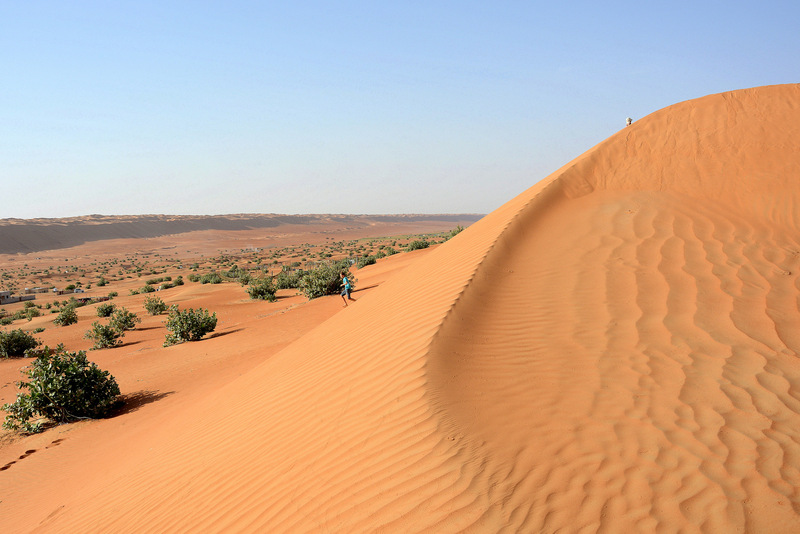 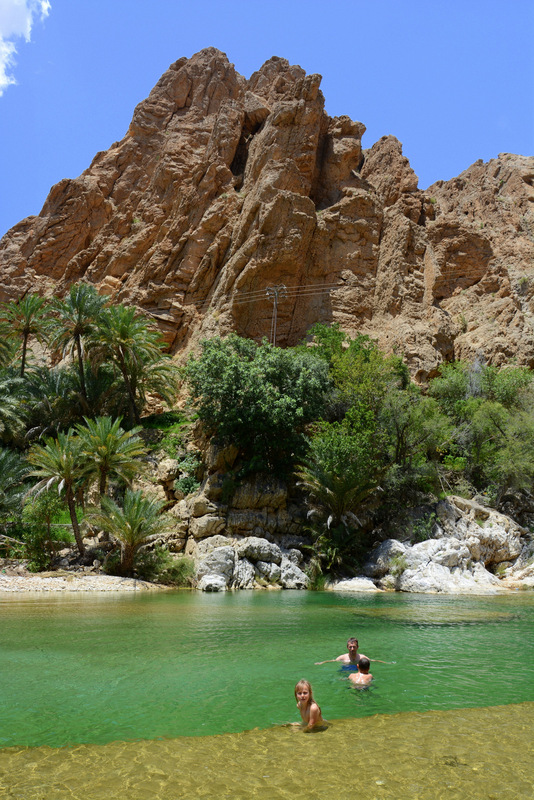 Oman is a country that surprised us the most since we are traveling – positively surprised. 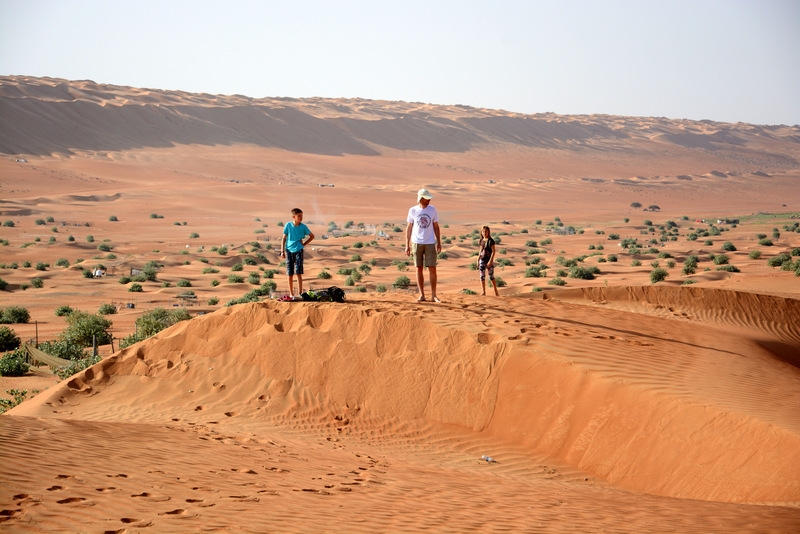 We could easily classify this trip among our top three travels. 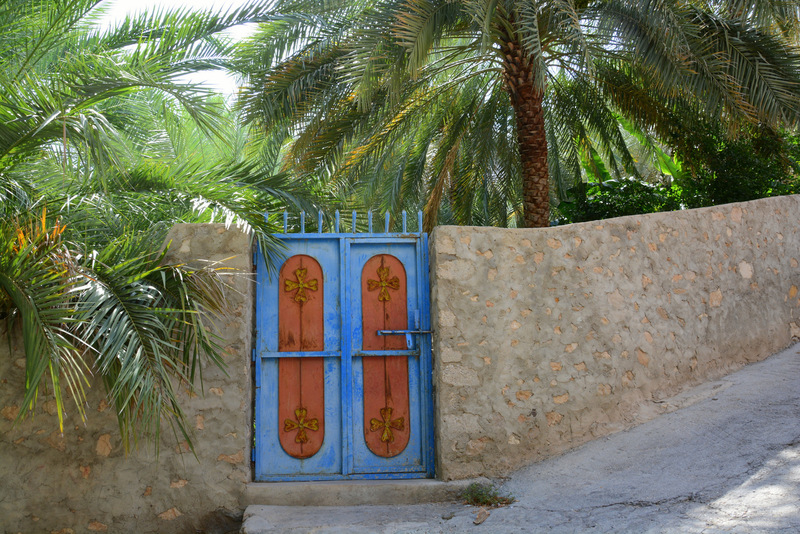 There are many stereotypes about Arabic countries, but lately security is the most important question. 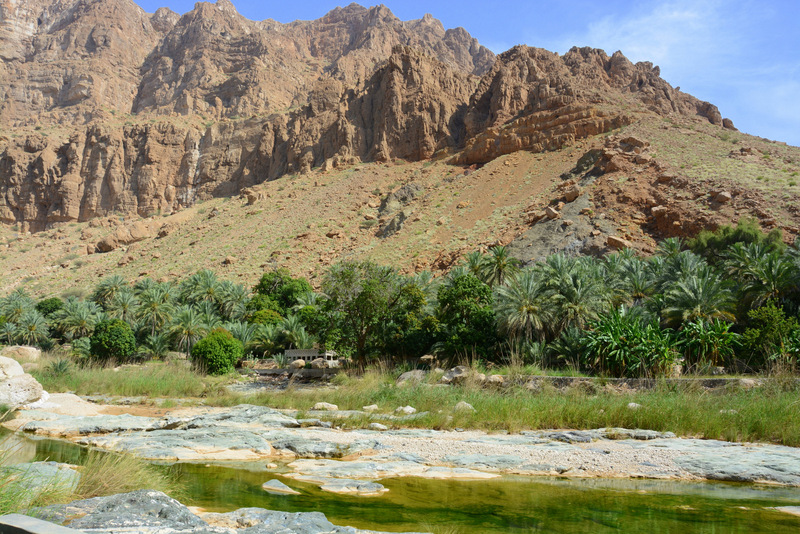 Oman is very safe, kind, clean, special, authentic and fairytale-like country. 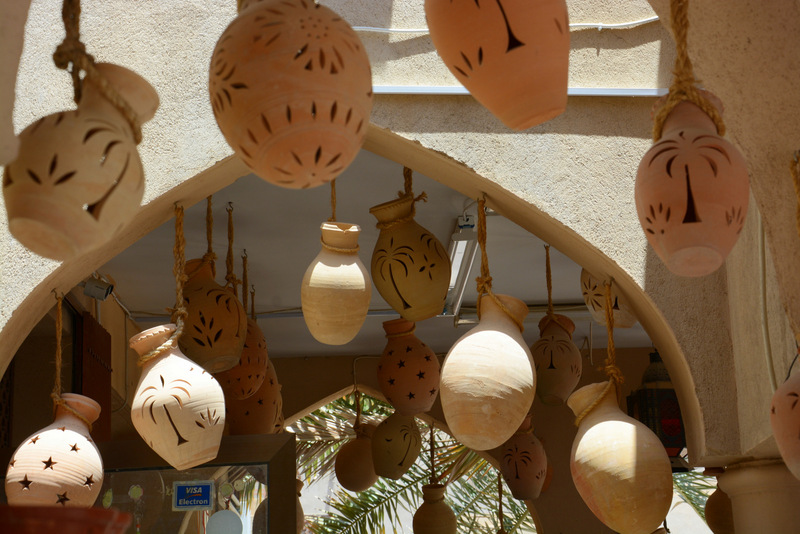 It is great for overcoming stereotypes and prejudices and great for getting to know new cultures, customs, traditions and religions. 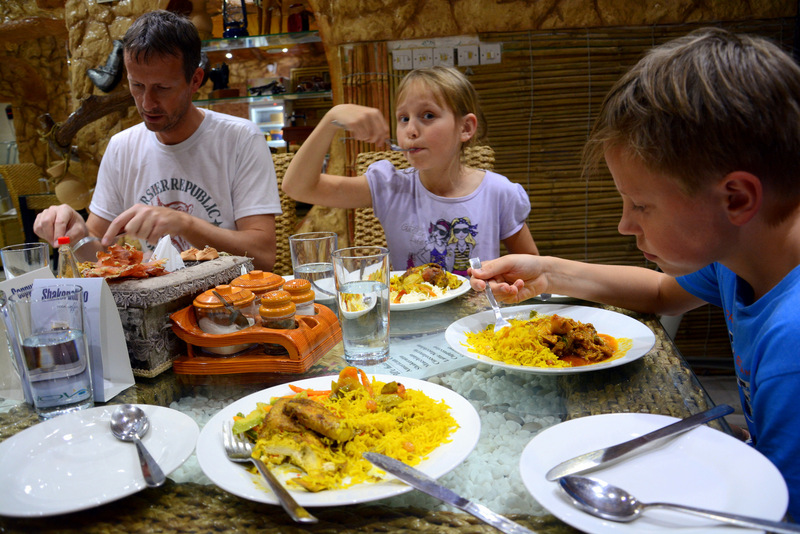 Even with kids, or better – especially with kids. 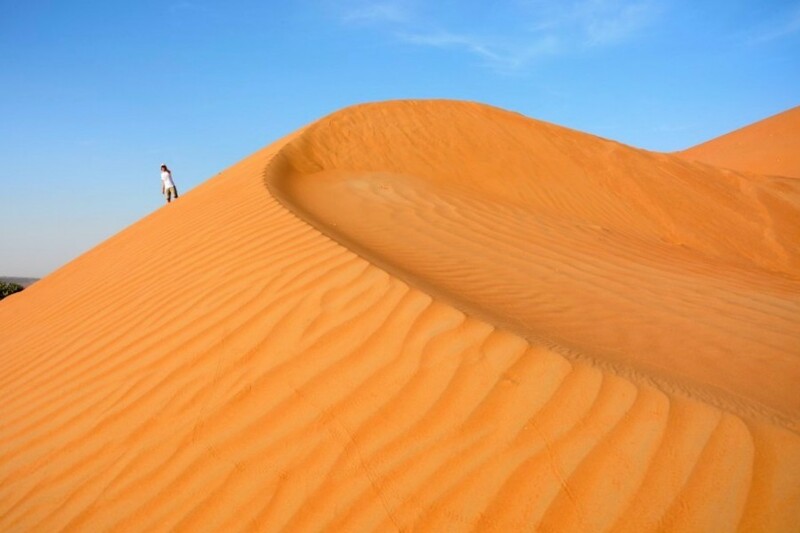 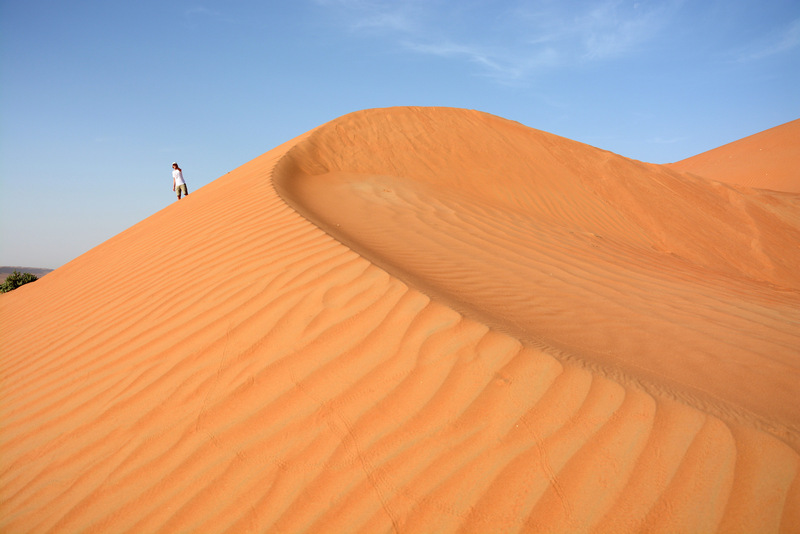 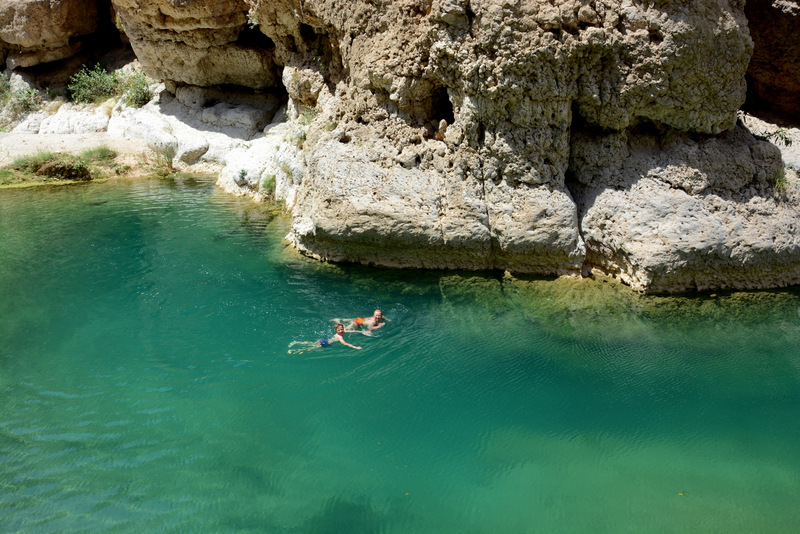 The best time to visit Oman is in our autumn and winter months. 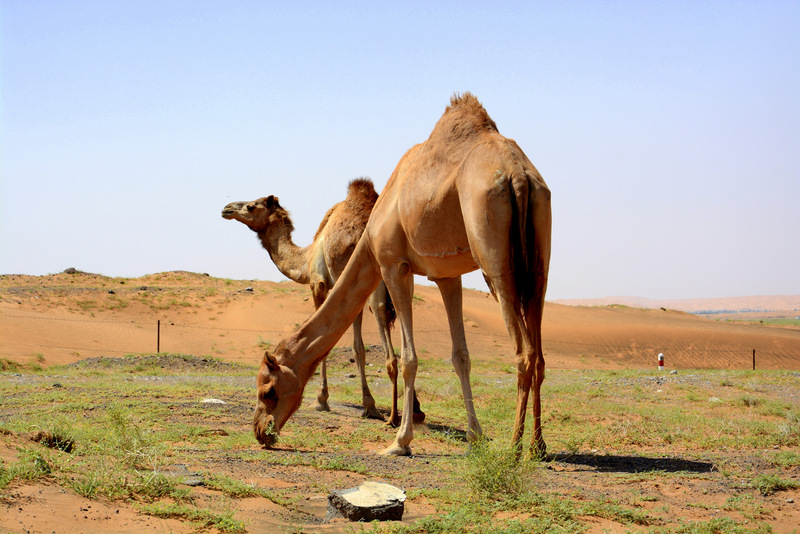 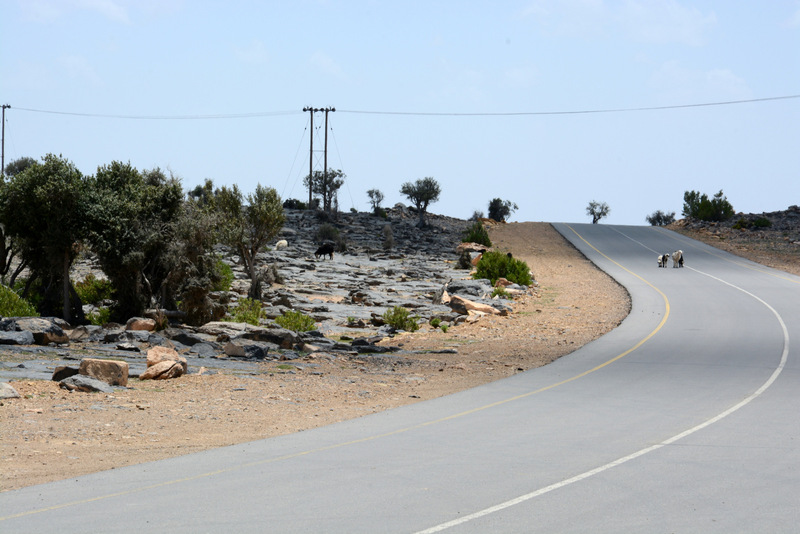 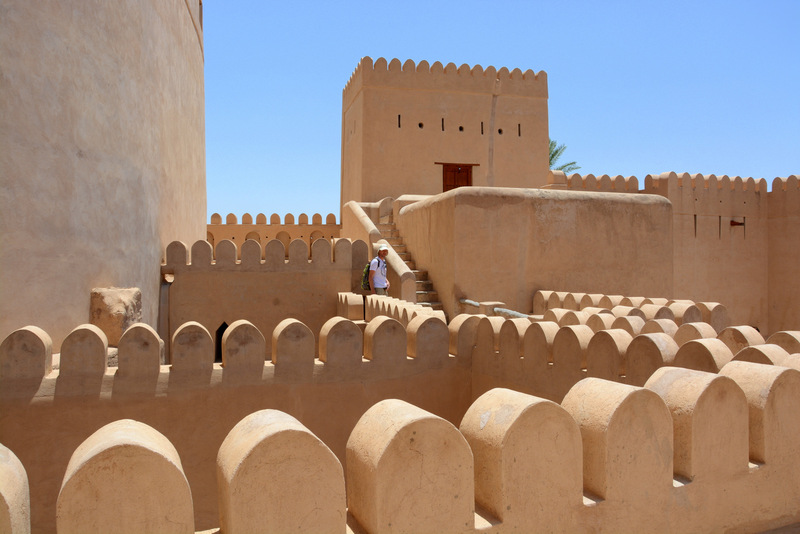 Traveling around is easy and actually the biggest challenge is to find the cheapest way to come to Oman. 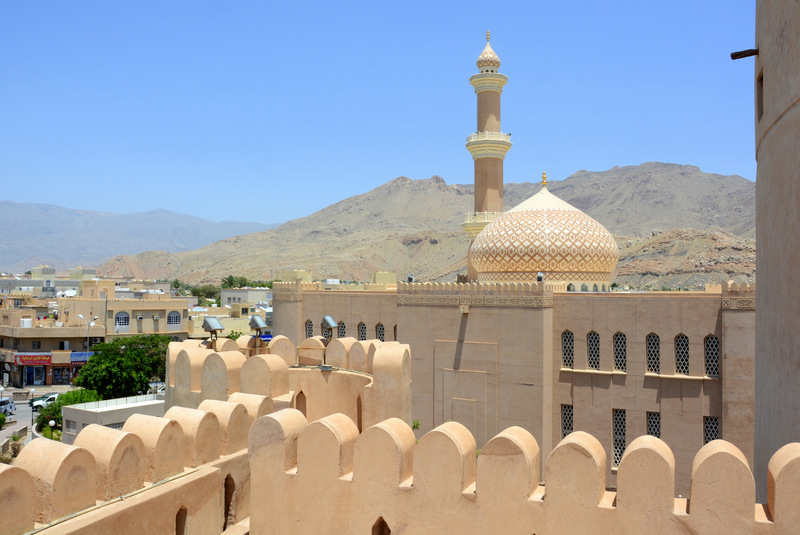 Plane tickets to capital Muscat are quite expensive, so we recommend combination with UAE – it is much easier to get good deal on tickets to Dubai or Abu Dhabi. 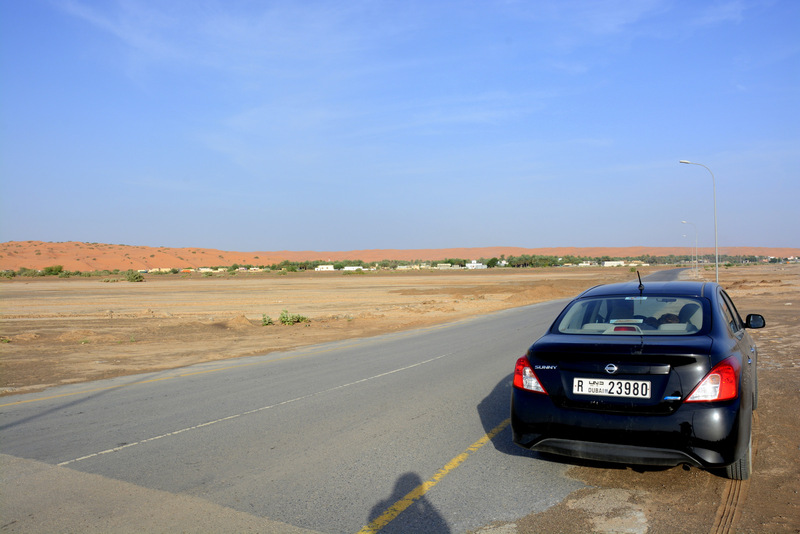 On contrary to some hesitations we heard regarding renting a car in UAE and driving over the border to Oman, we didn´t have any problems. 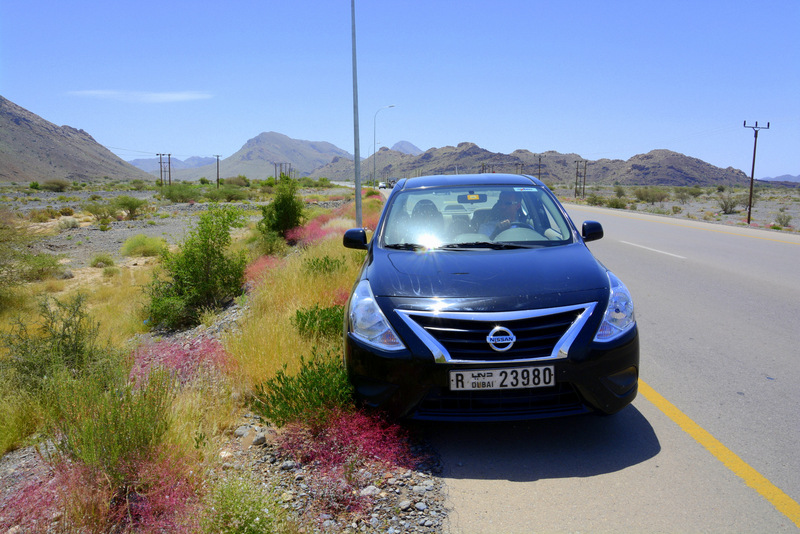 However, the truth is that we were prepared and we covered all the insurances ahead of our trip. 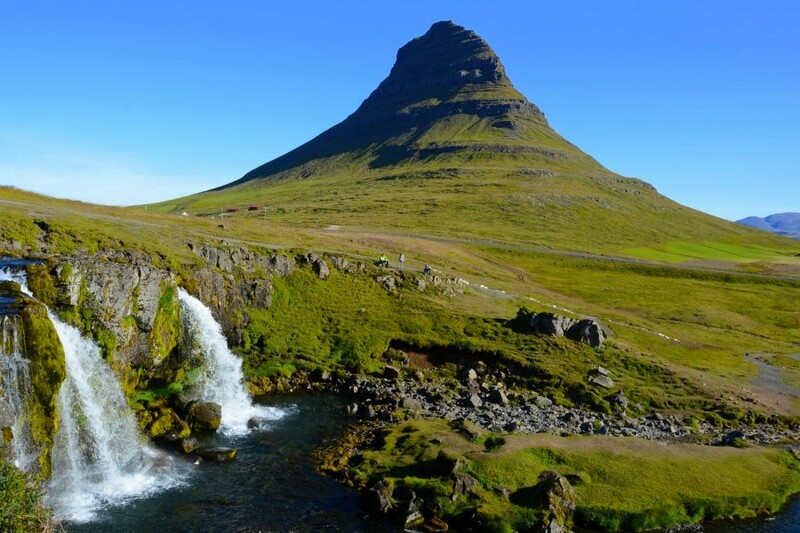 And in that case the travel is easy, believe me. 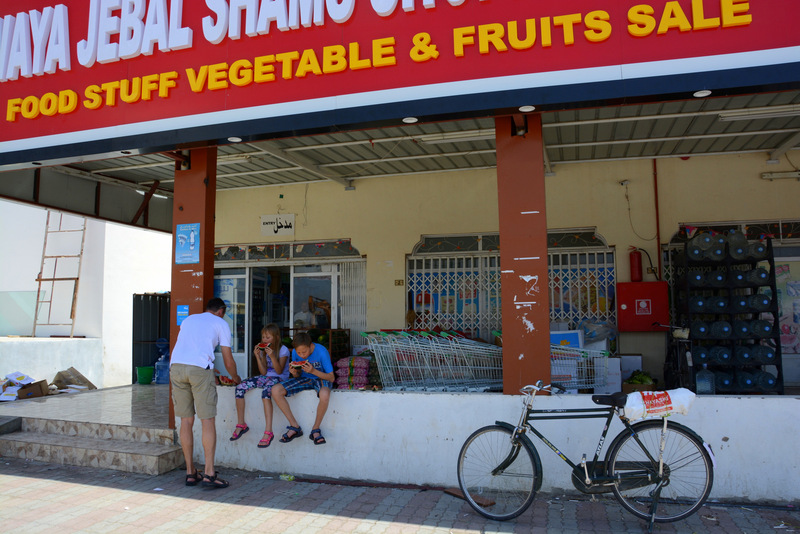 The roads are great, food is good and cheap, gasoline even cheaper, hotels a little more expensive – but it evens with low prices of food and gasoline. 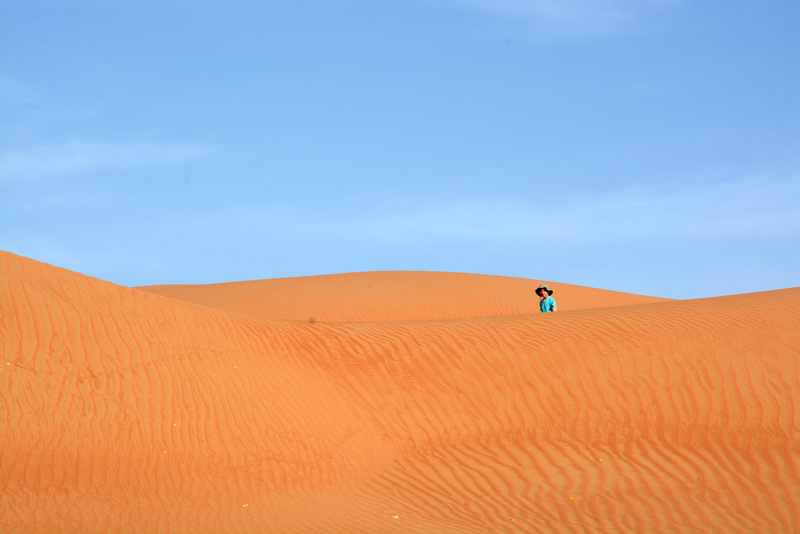 People are unbelievably and genuinely friendly and always and everywhere willing to help – without any expectations of something in return. 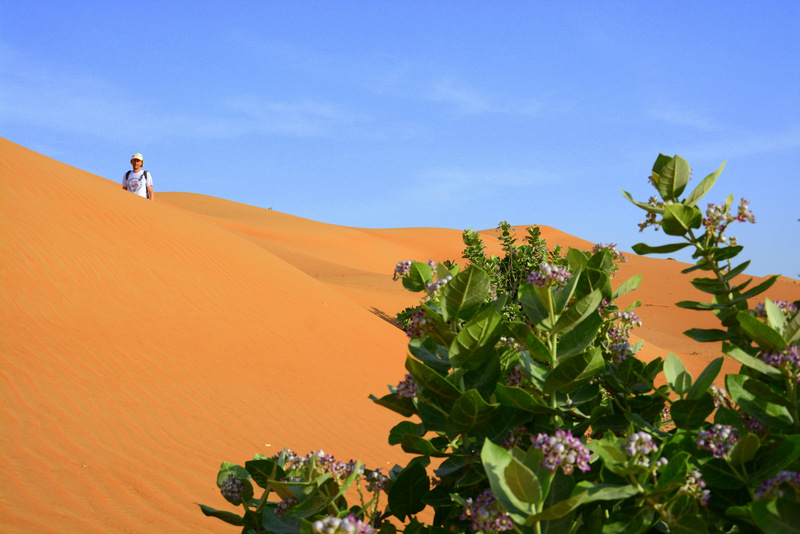 The weather is sunny and warm, without clouds, nature and its beauty is to knock you off. 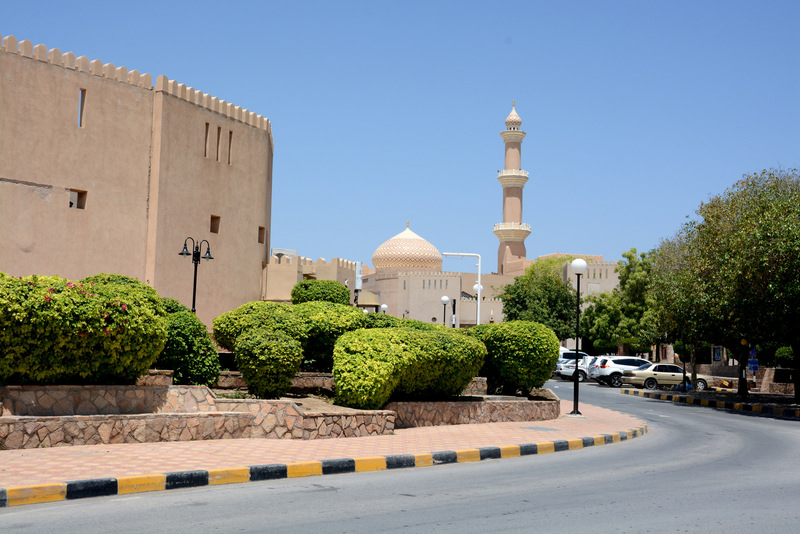 You can read more about logistic of our trip to Oman with some advices about insurances and renting a car in an article “Oman and UAE– some logistic and technical information”. 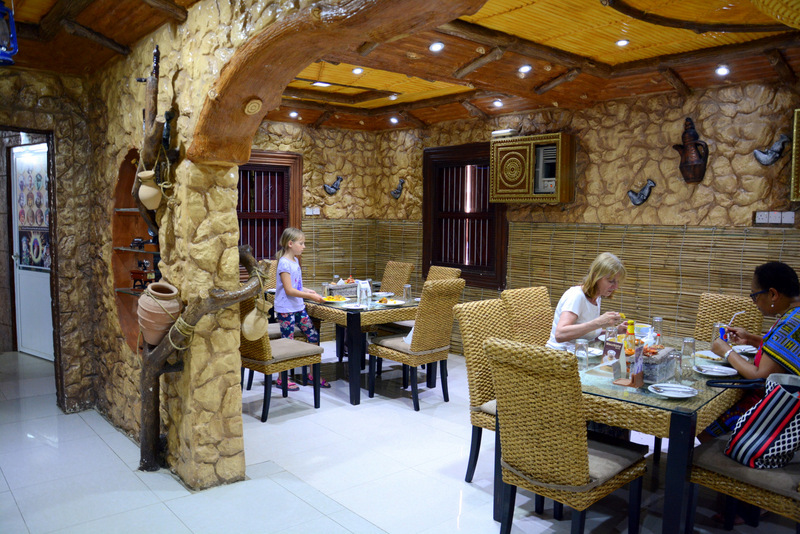 But you can also contact us and we will help you with some advice. 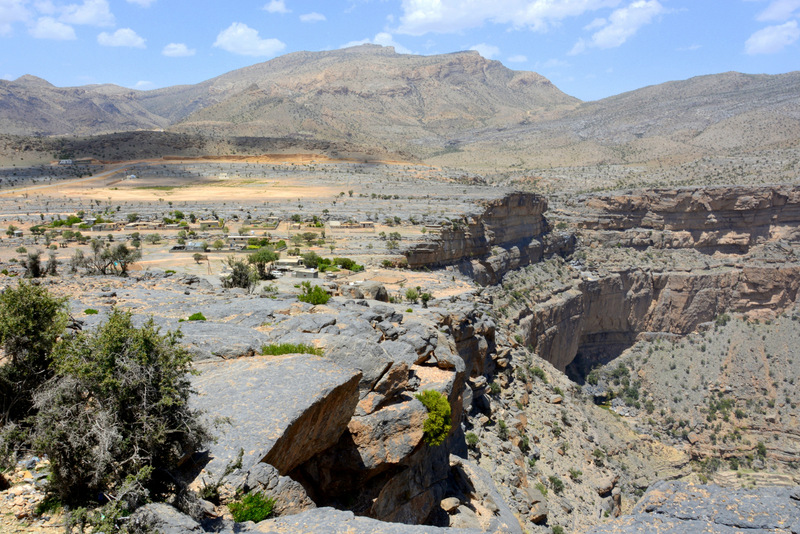 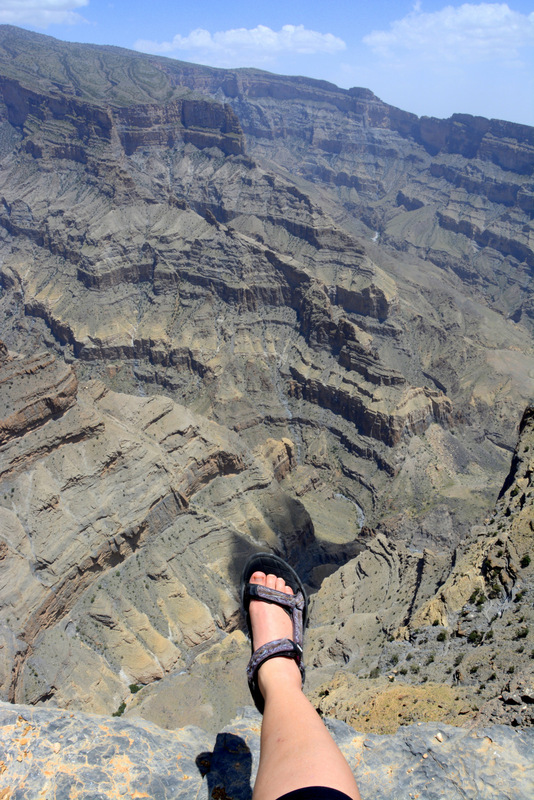 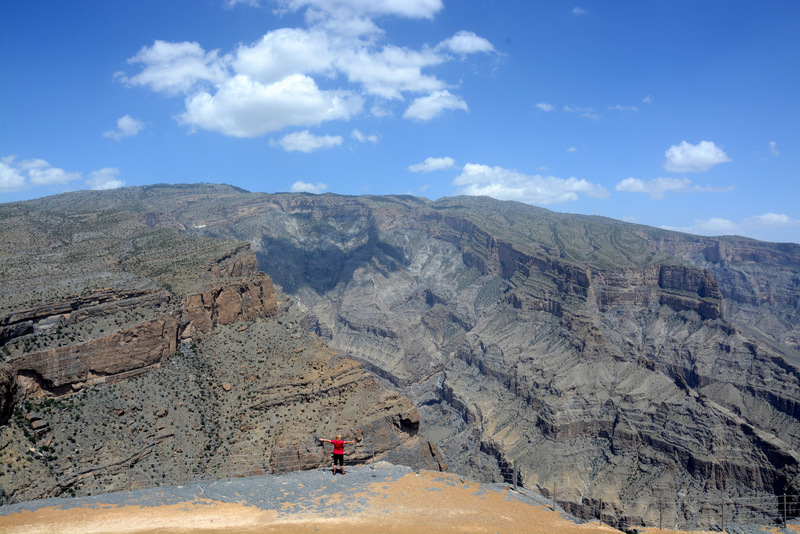 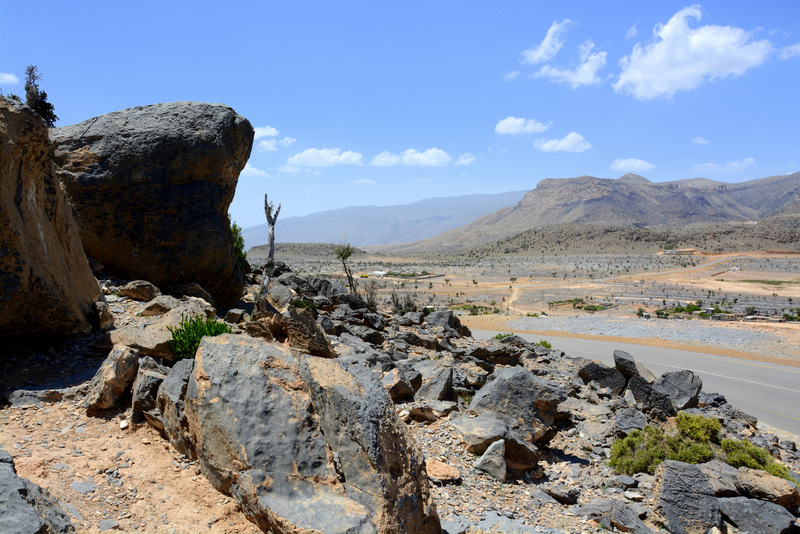 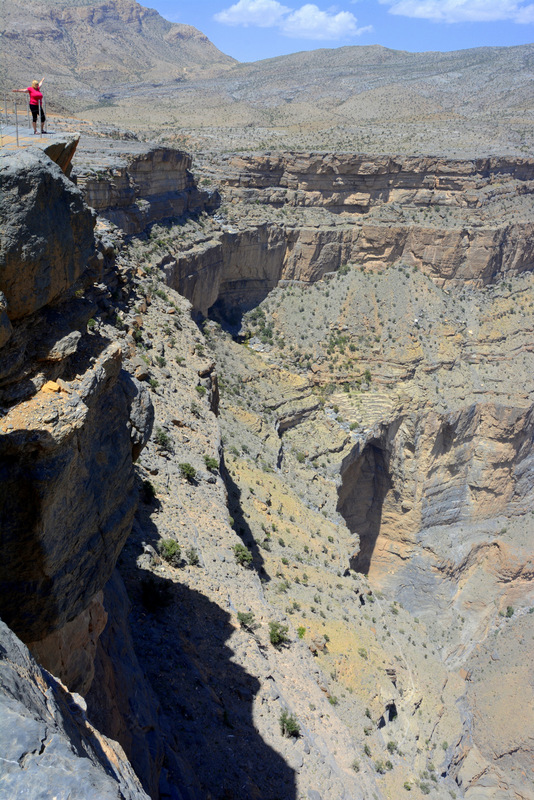 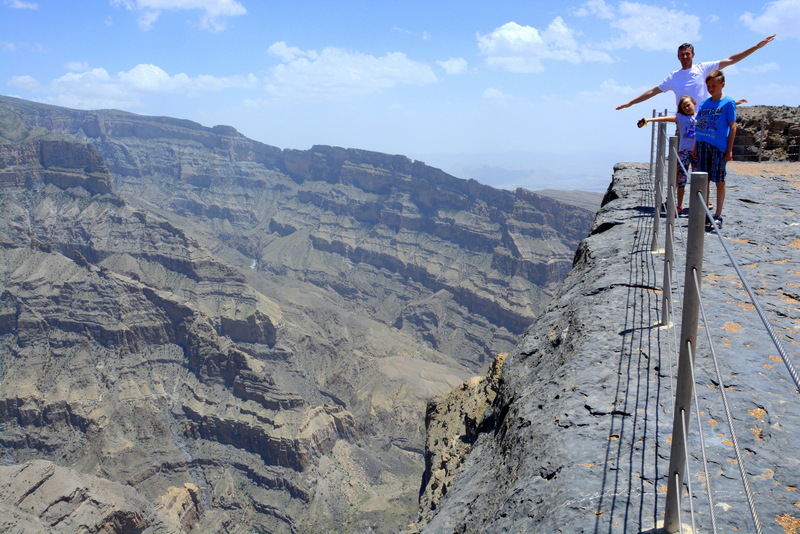 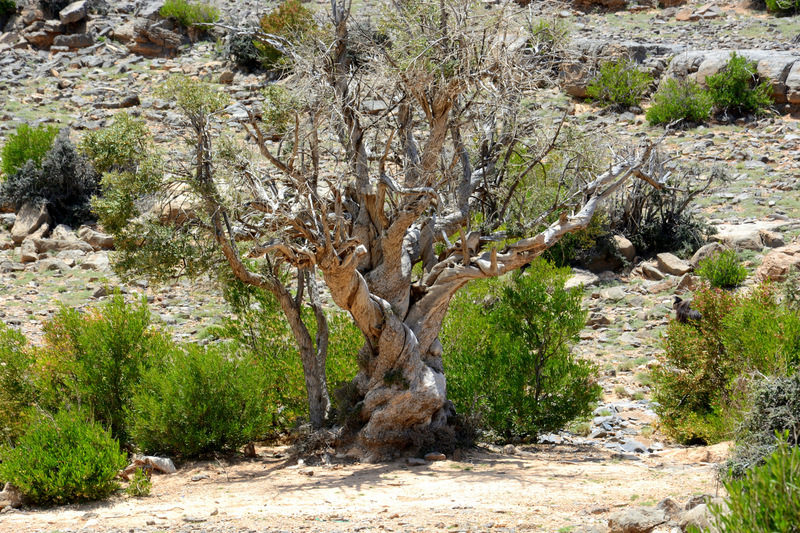 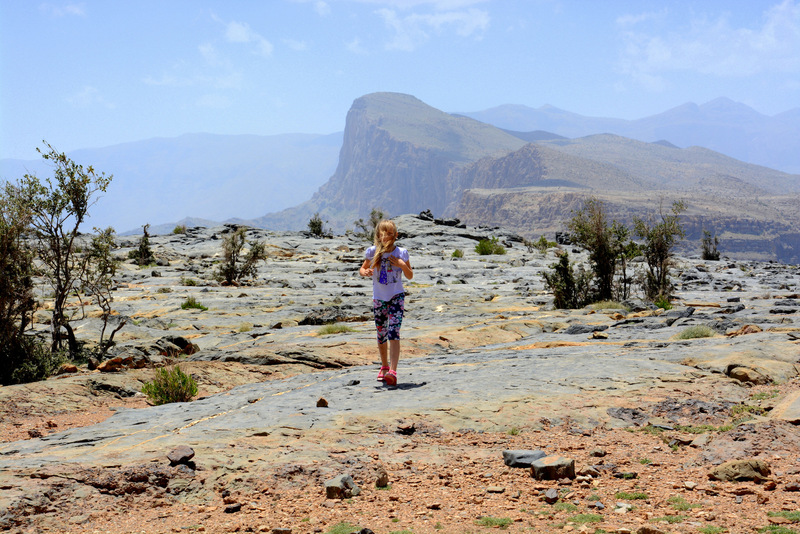 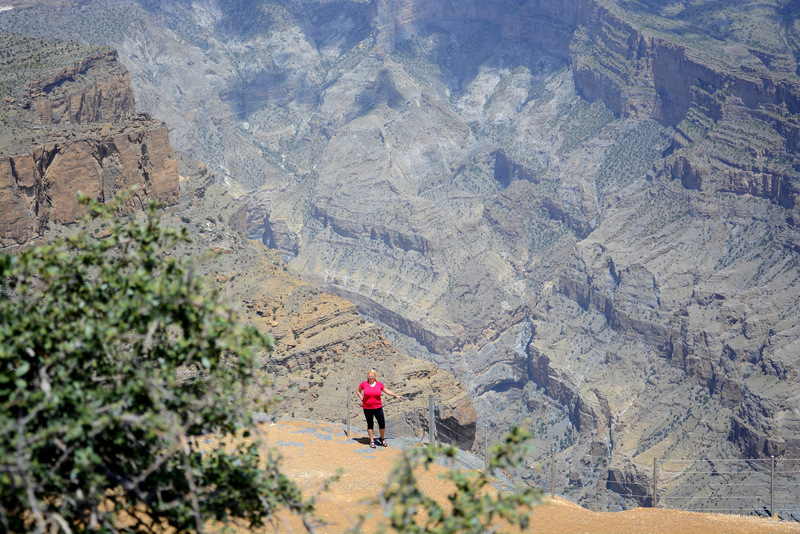 Jebel Shams is the highest peak of Oman´s high mountain range and nearby is famous Grand Canyon of Arabic world. 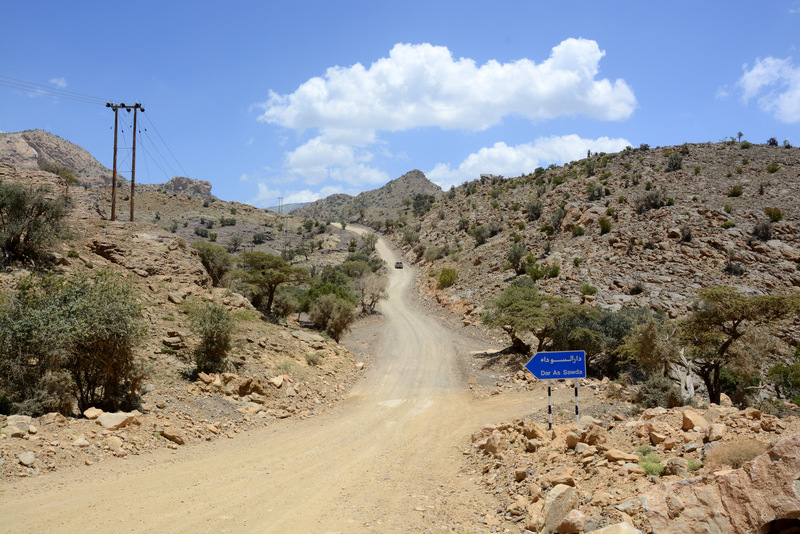 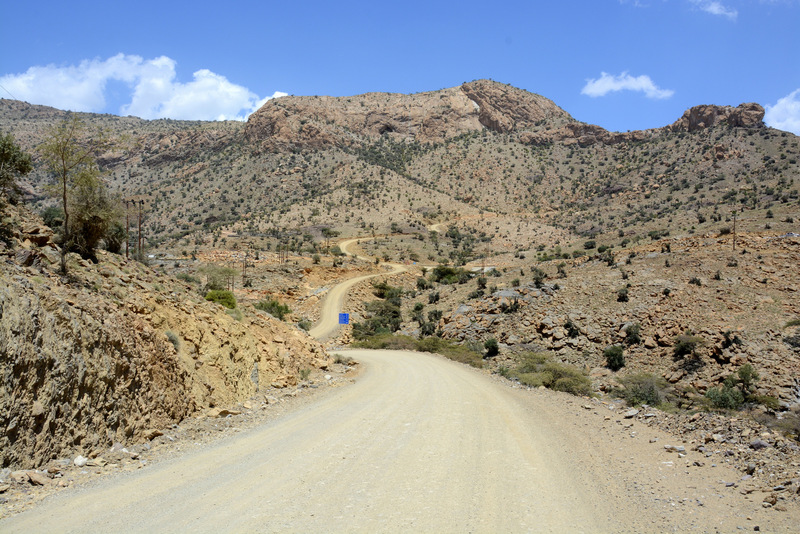 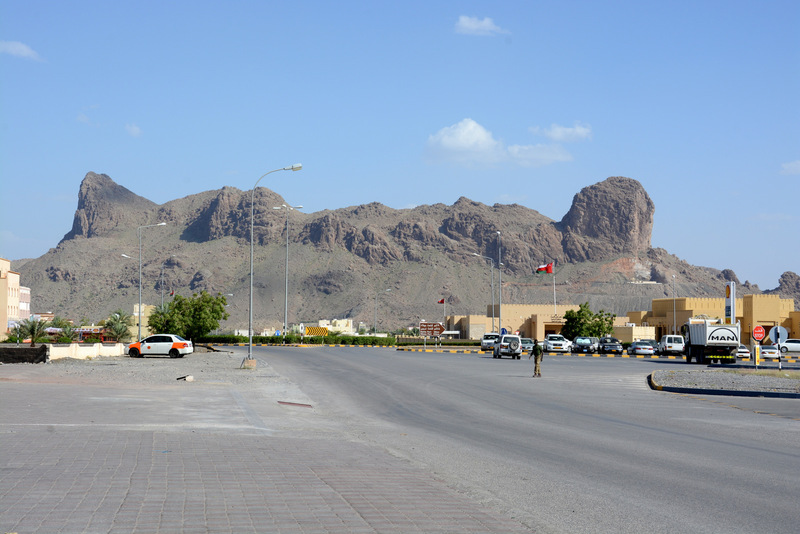 Starting point to see this mountainous part of Oman are towns Al Hamra or Bahla, or even a little more distant Oman´s former capital – Nizwa. 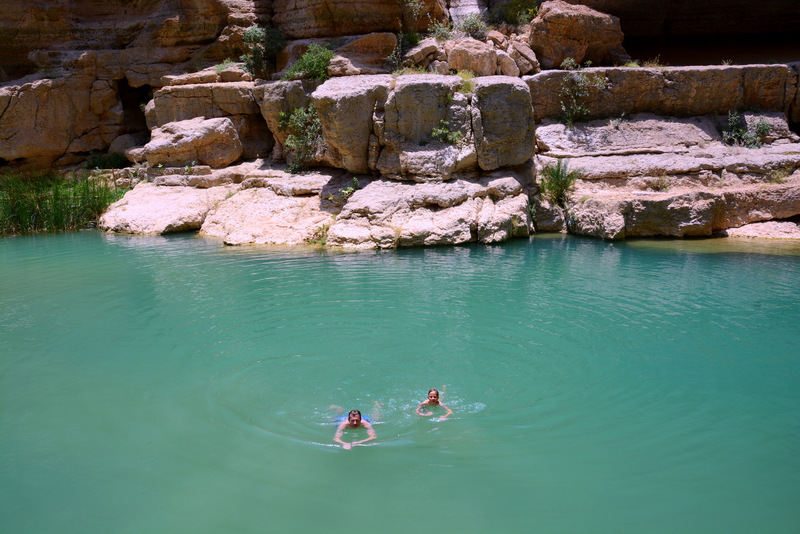 To see Grand Canyon you don´t necessarily need four-wheeler, but if you will rent one, you should go and see wonderful village Bilad Sayt. 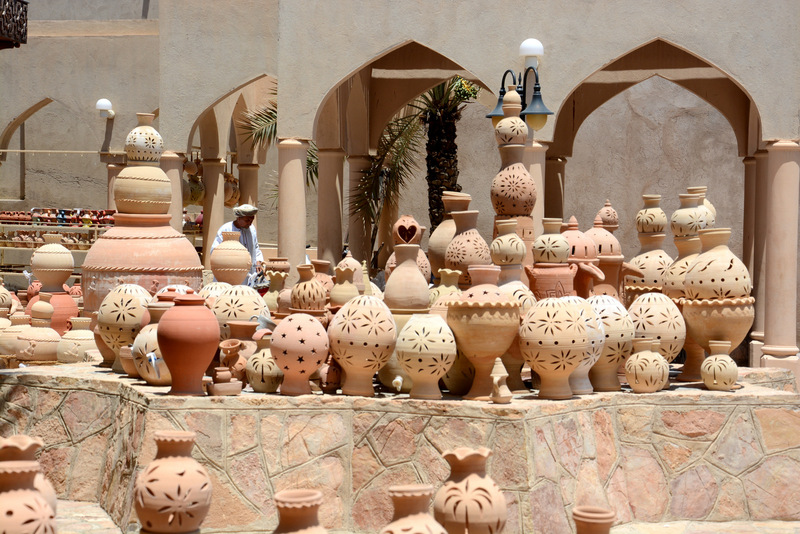 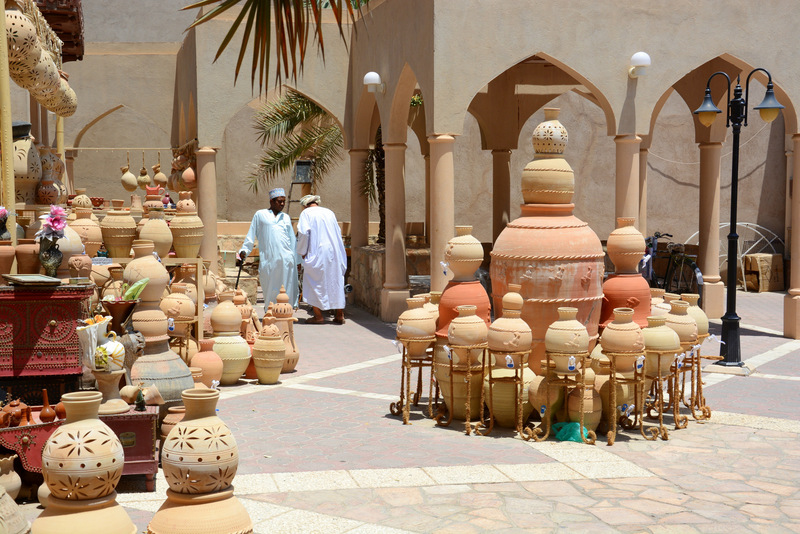 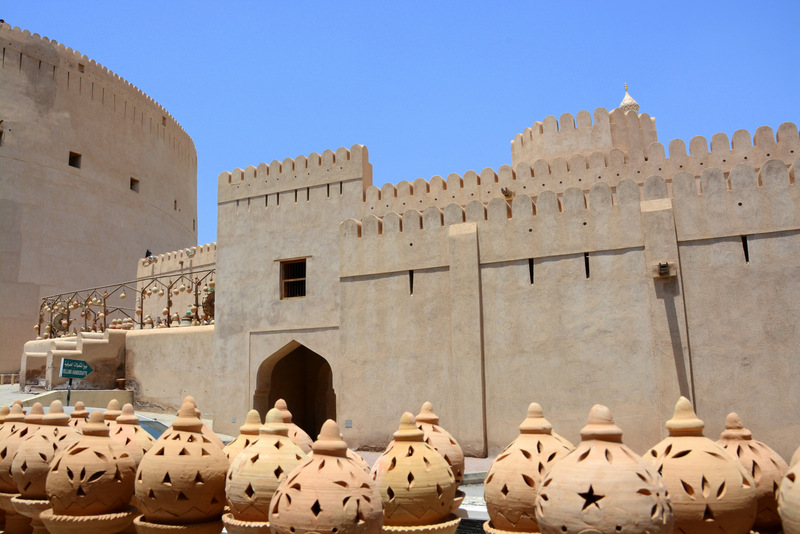 Nizwa is Oman´s former capital that still offers authentic beat of local life. 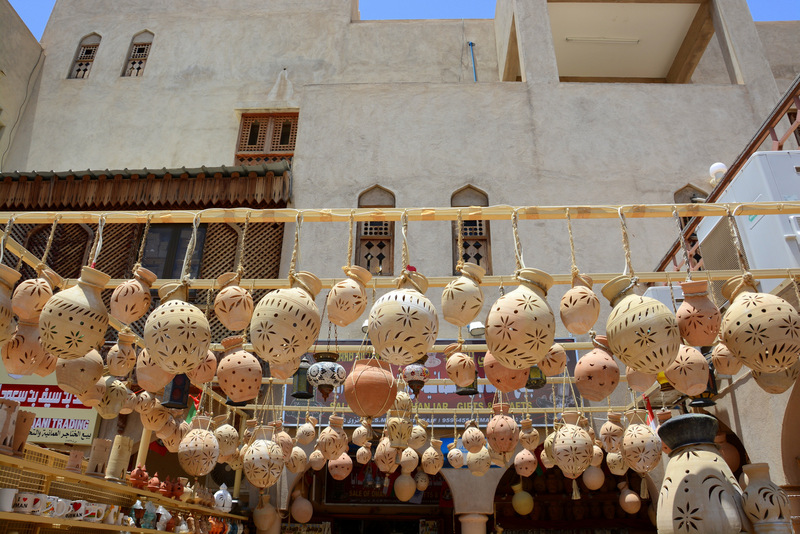 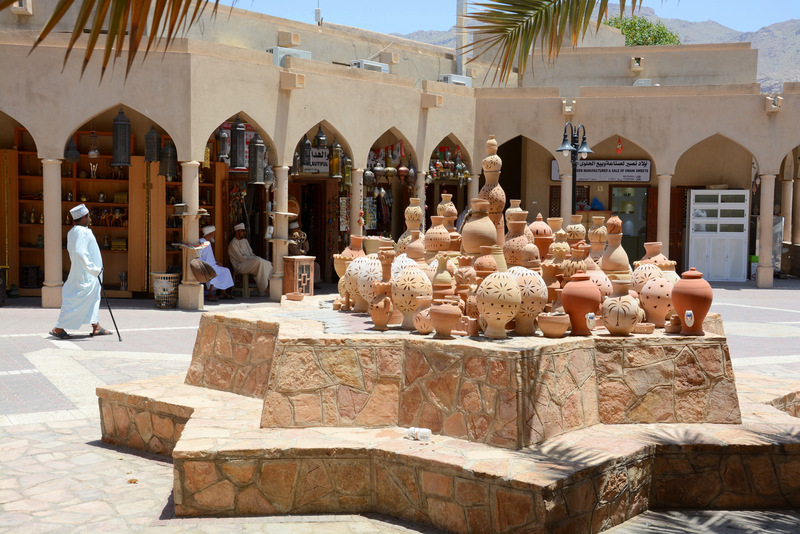 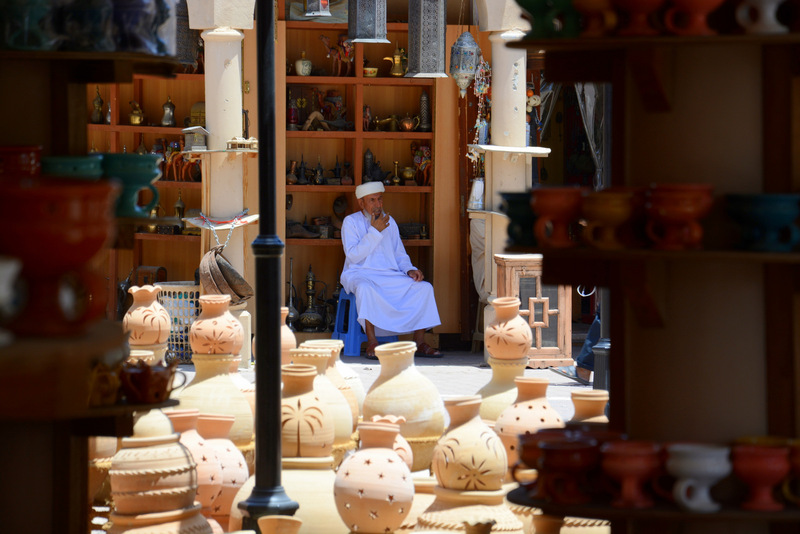 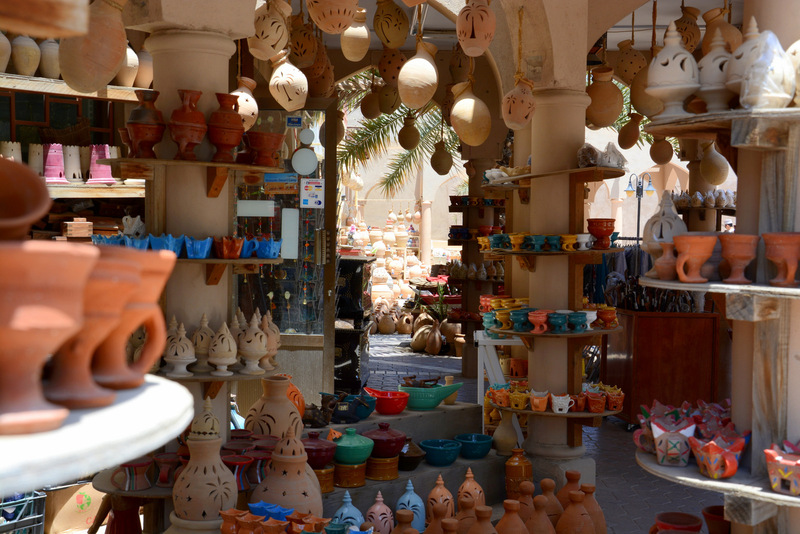 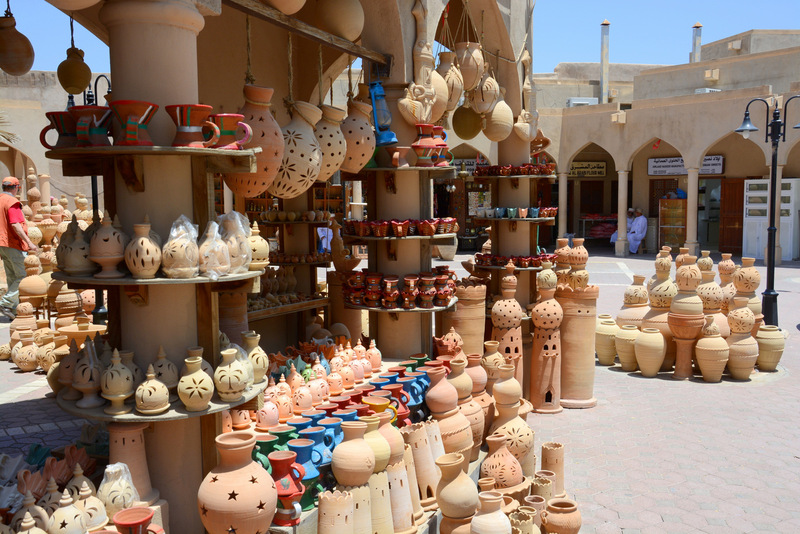 It is pure pleasure to walk on famous Nizwa souq – a market; to go to dates shops, where you can taste them and they offer you a coffee or tea and don´t expect you to buy anything. 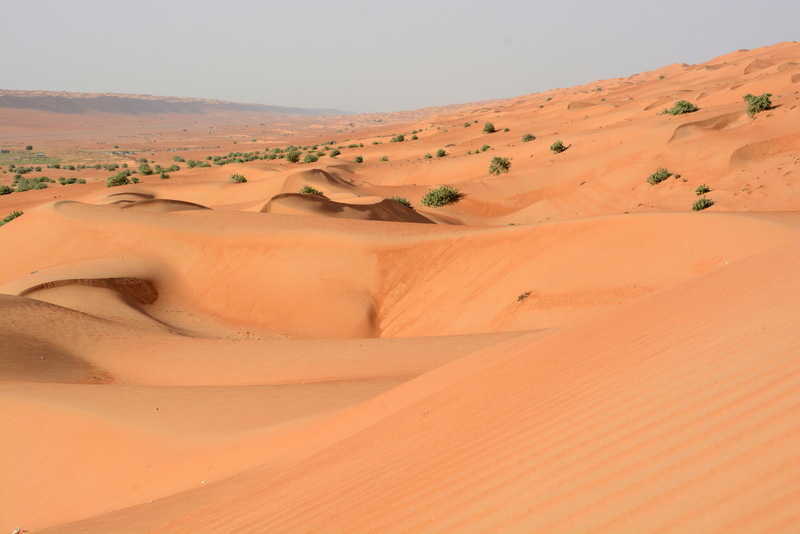 It is really something rare to see in west world and hard to believe from our point of view – in market-oriented society. 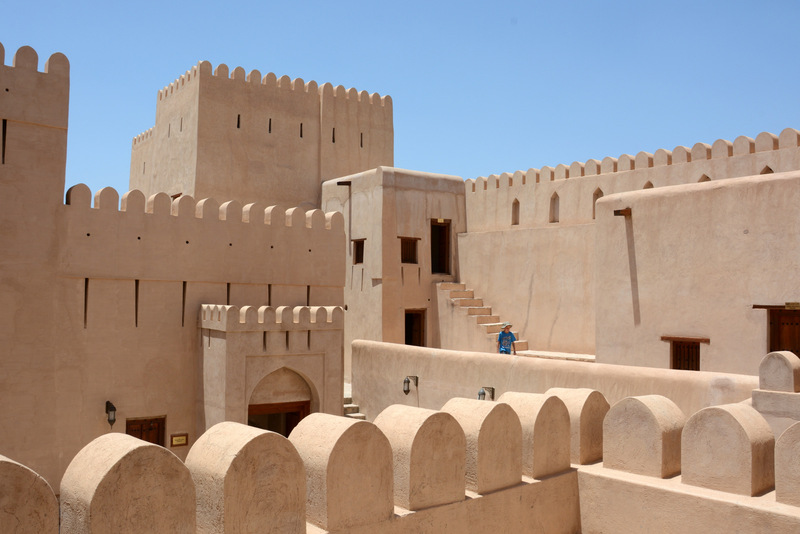 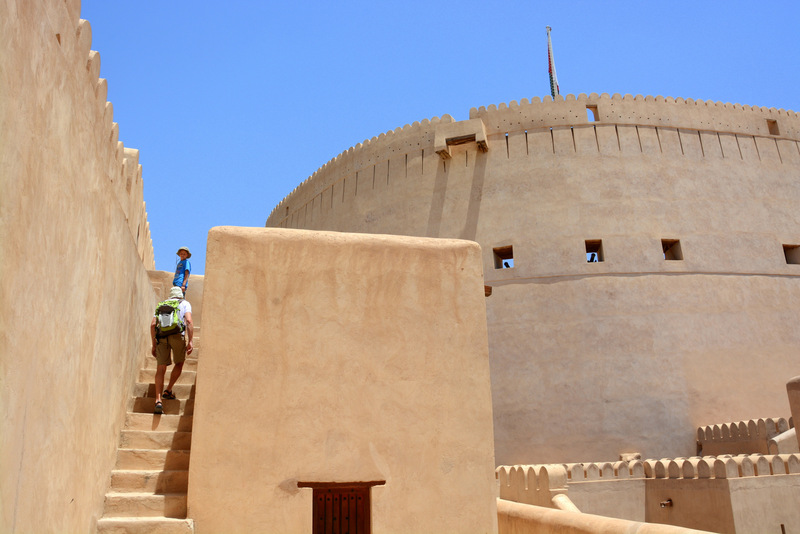 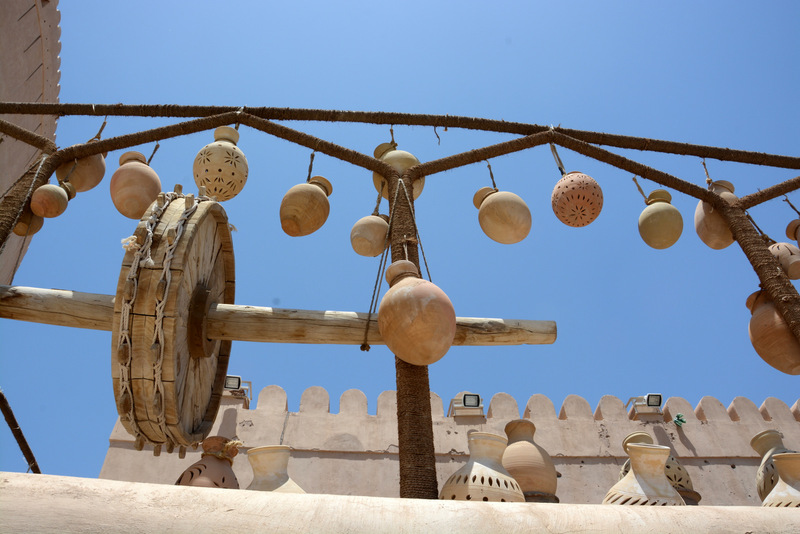 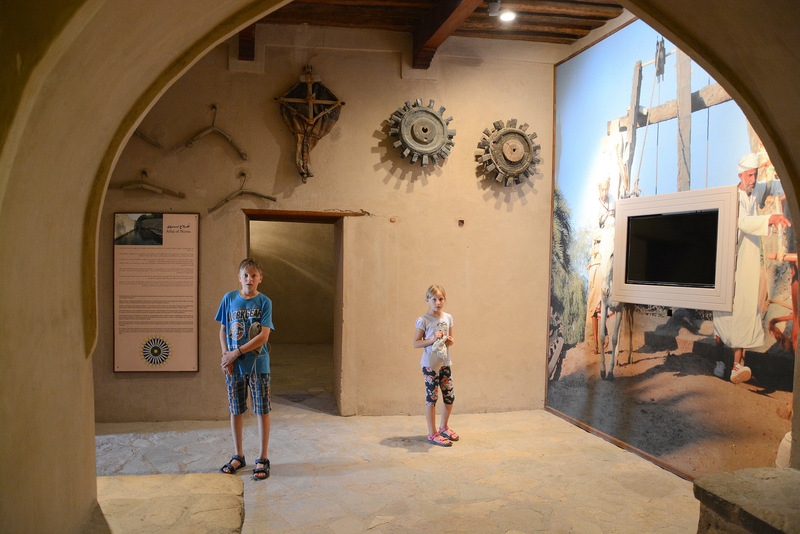 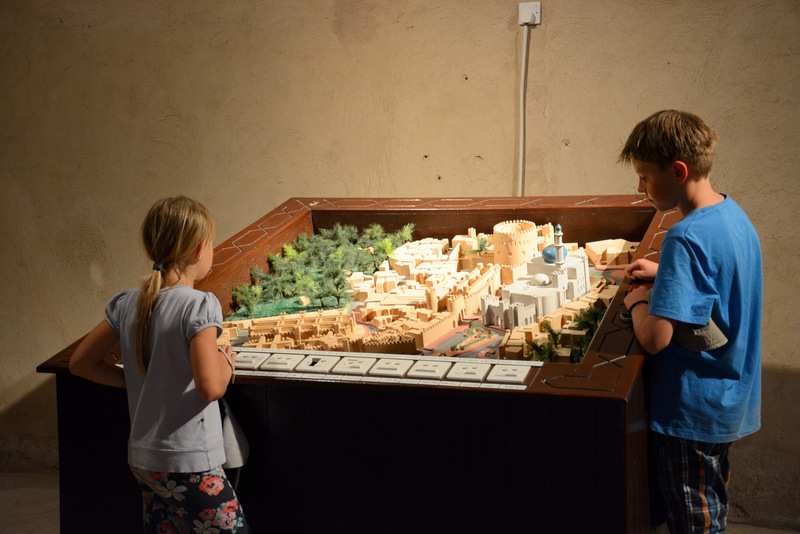 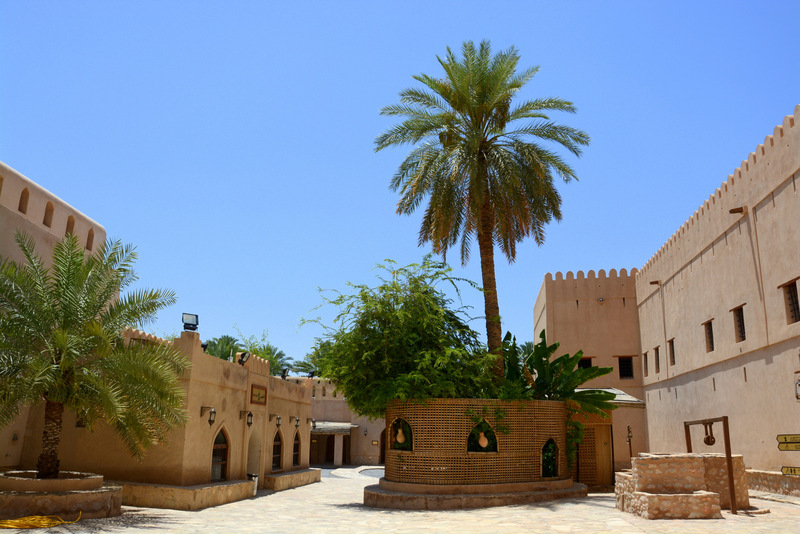 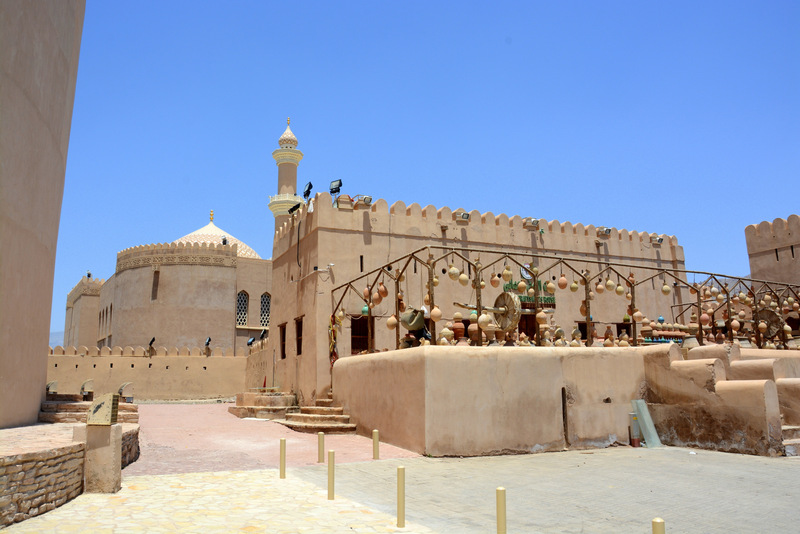 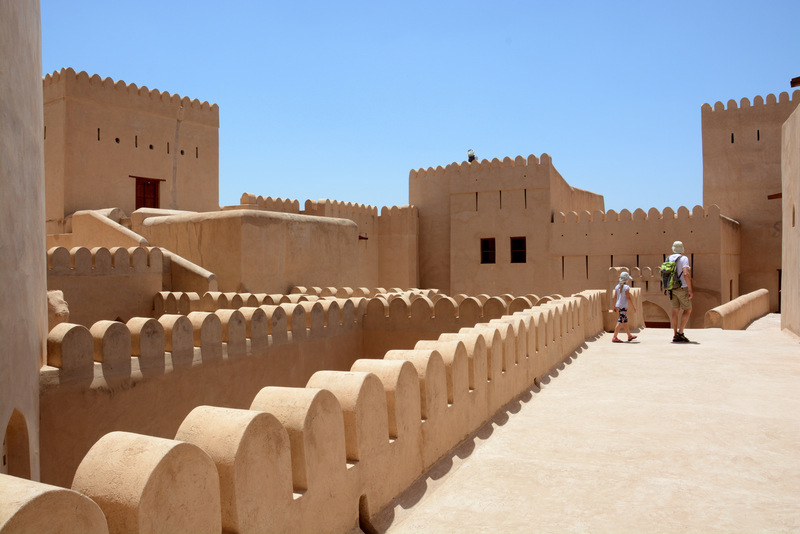 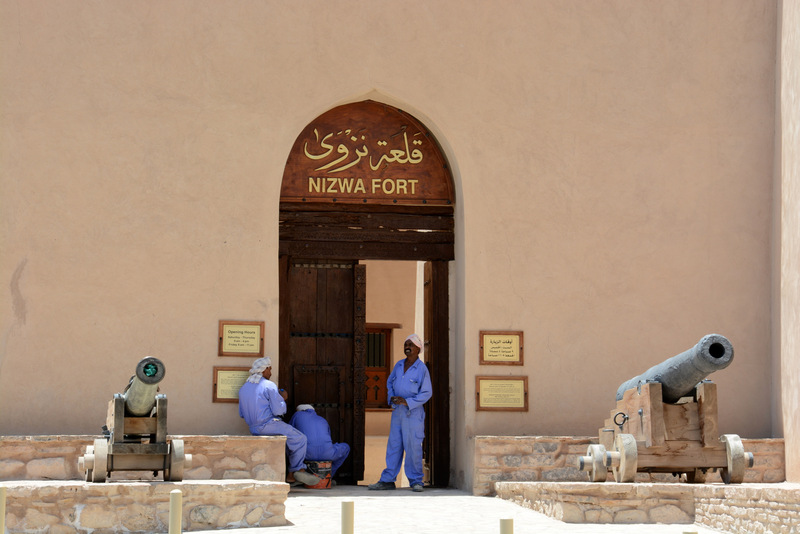 Besides wonderful Nizwa souq has something else to offer – Nizwa fort – we were almost alone when exploring it. 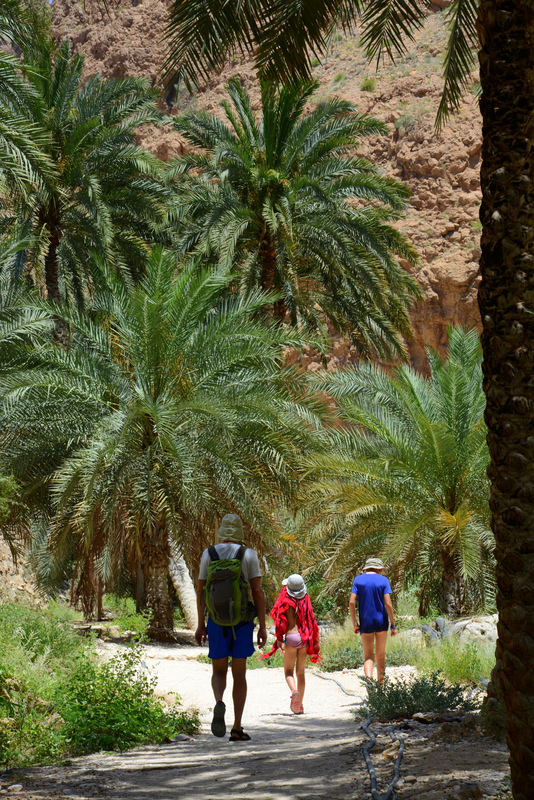 The only down side was heat, as first days of May are quite late to visit Oman. 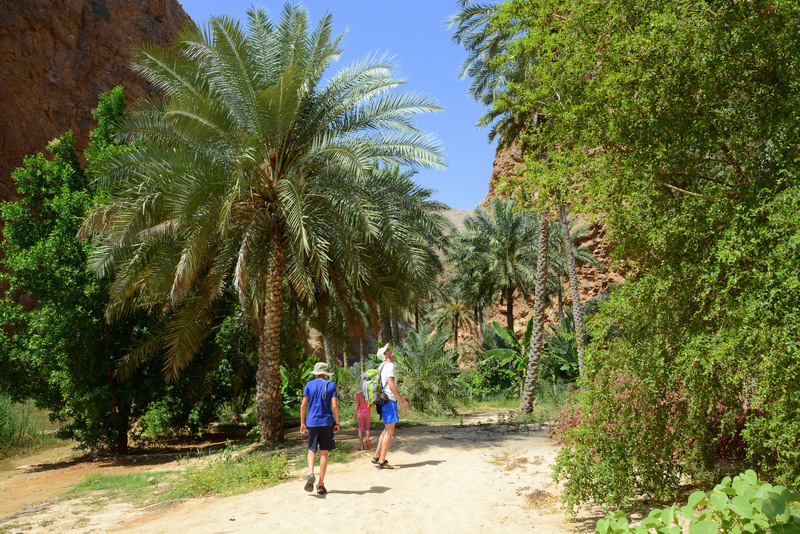 Peter likes to joke that Oman has only one season that accelerate: summer, hot summer, even hotter summer and crazy hot summer 🙂 . 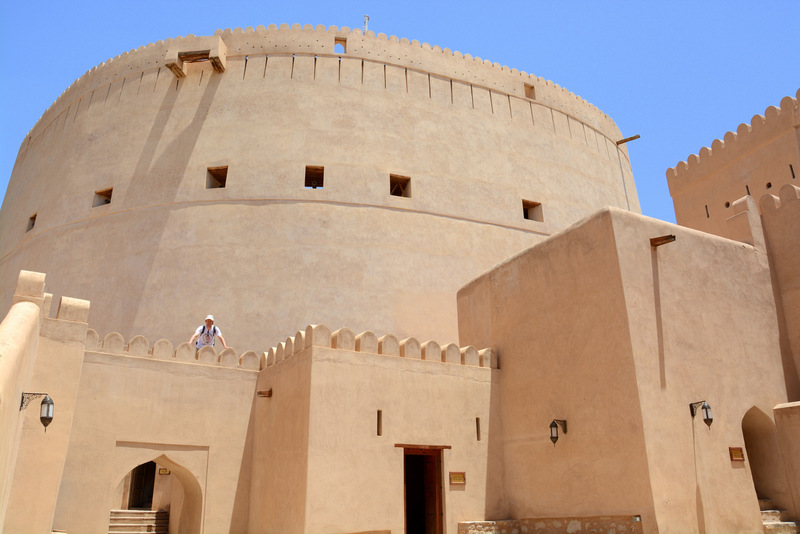 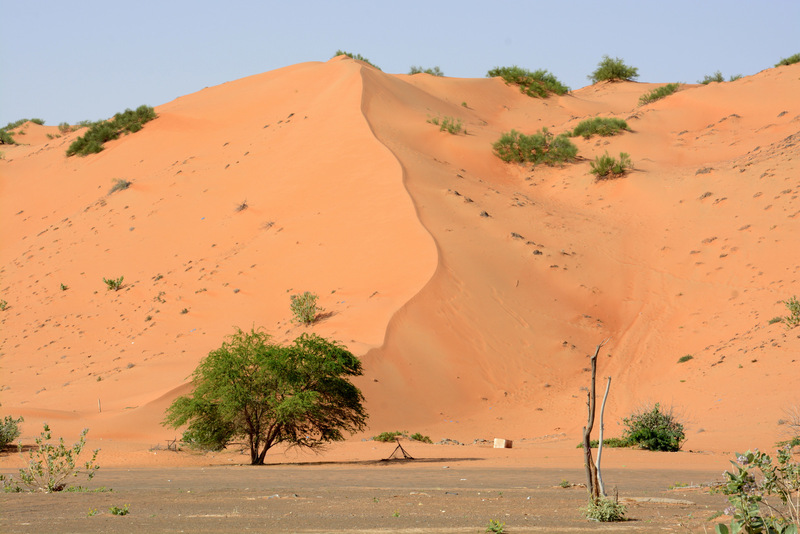 You should pick your timing of visiting Oman wisely and you will have great experience. 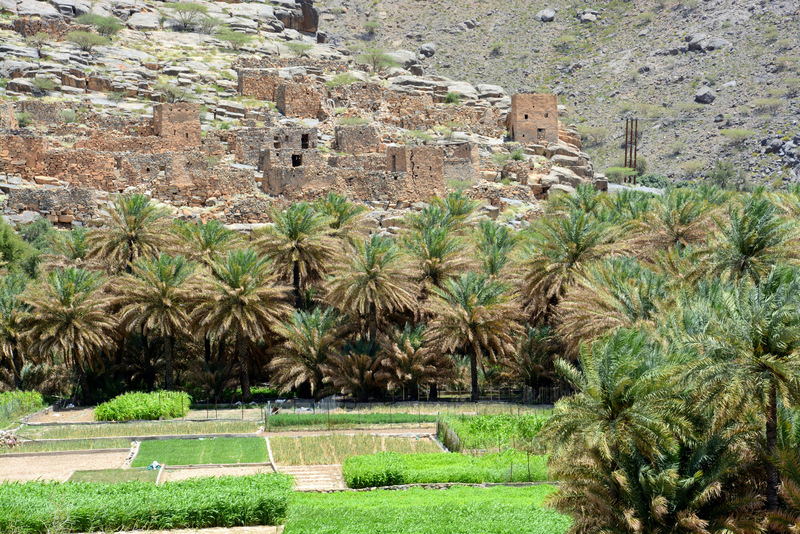 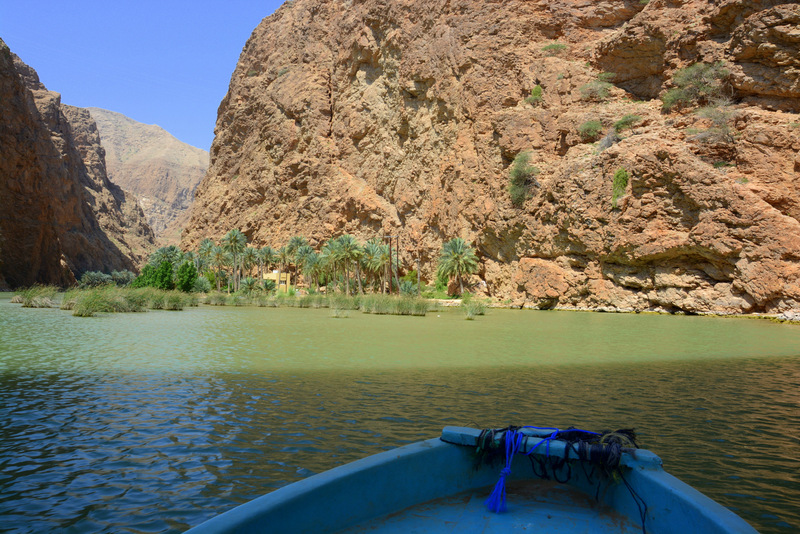 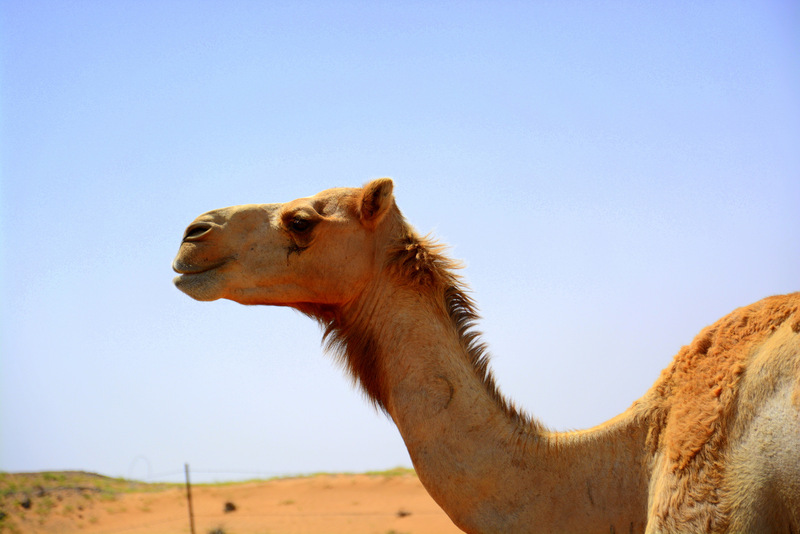 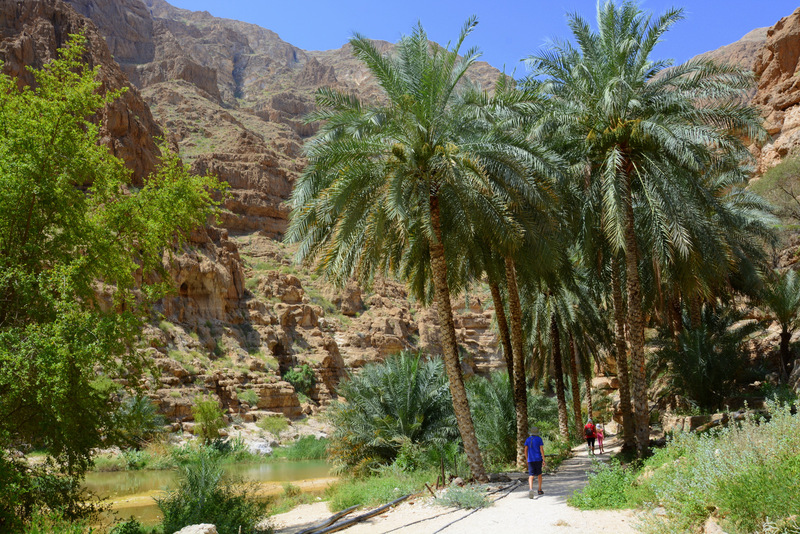 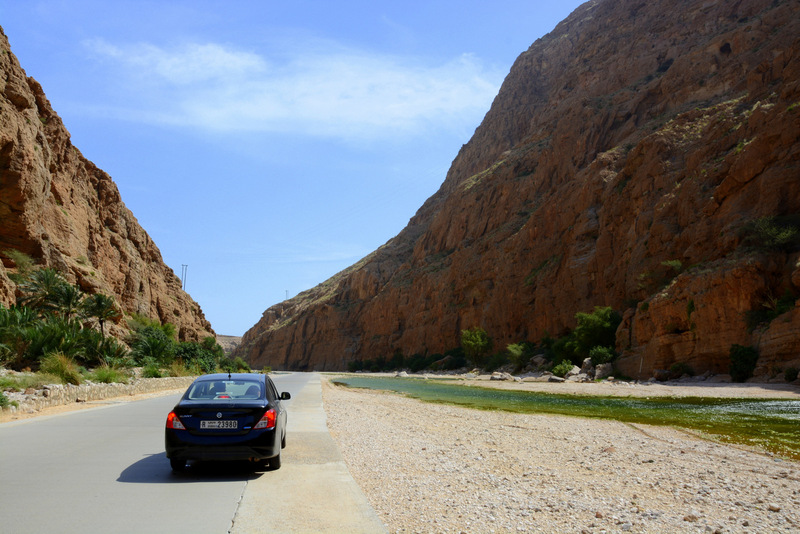 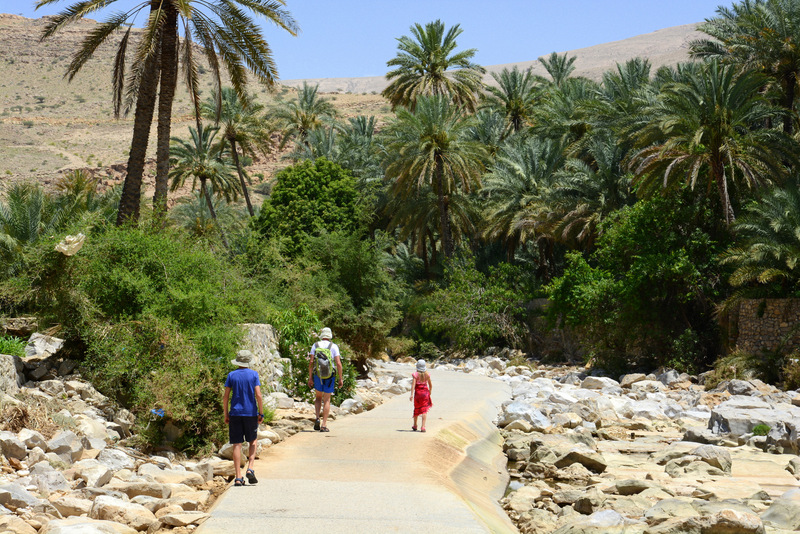 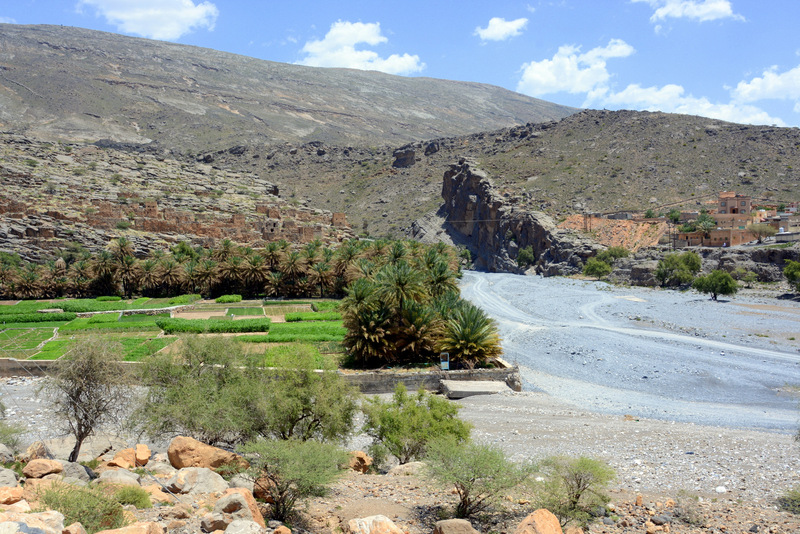 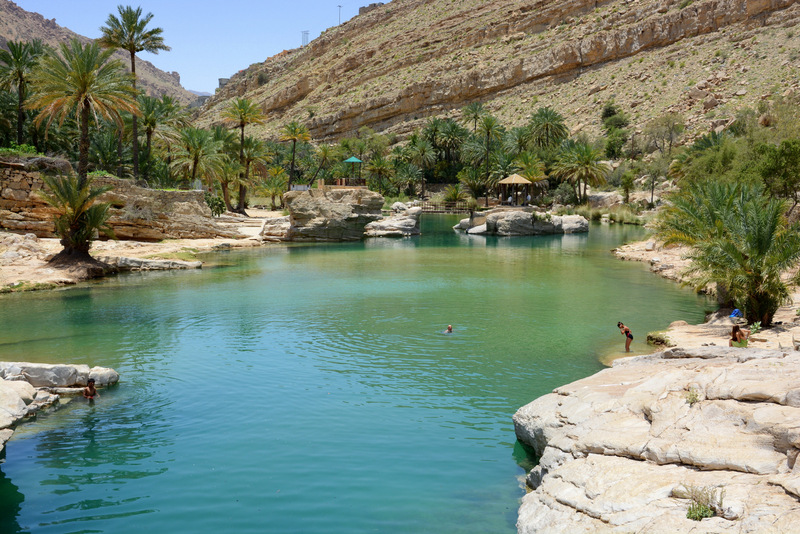 Wadi Bani Khalid was the first oasis that we visited when traveling through Oman and it was magical. 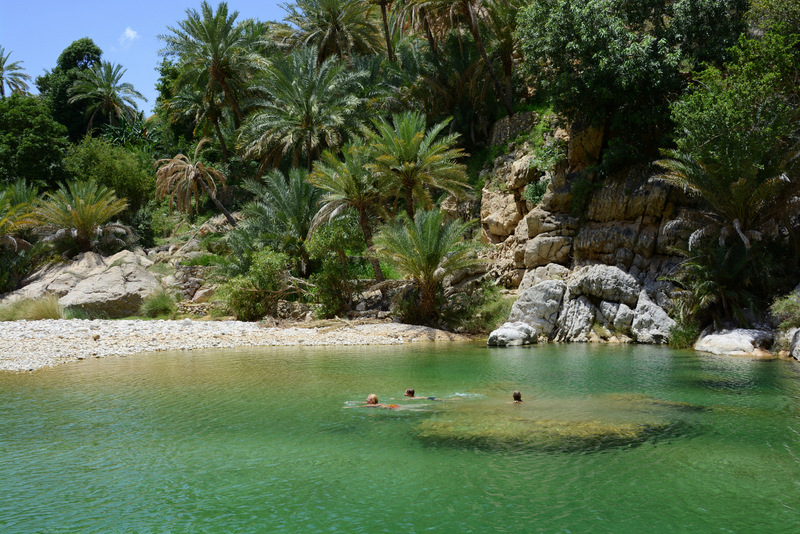 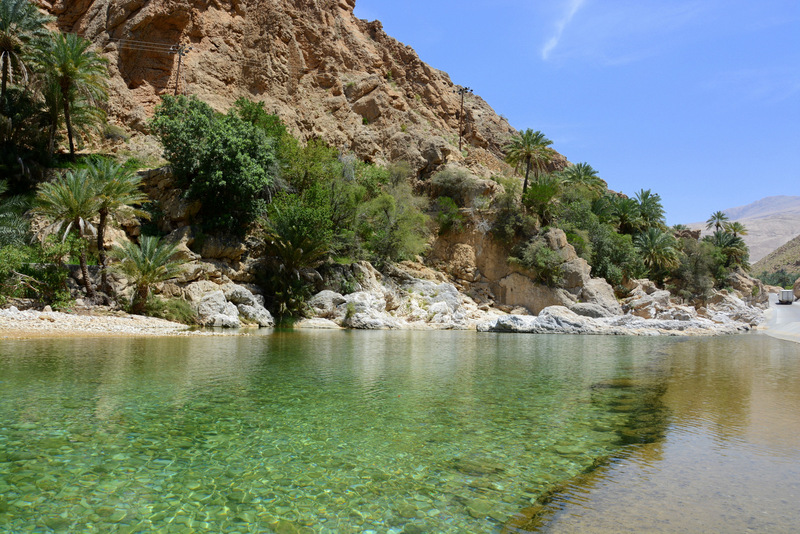 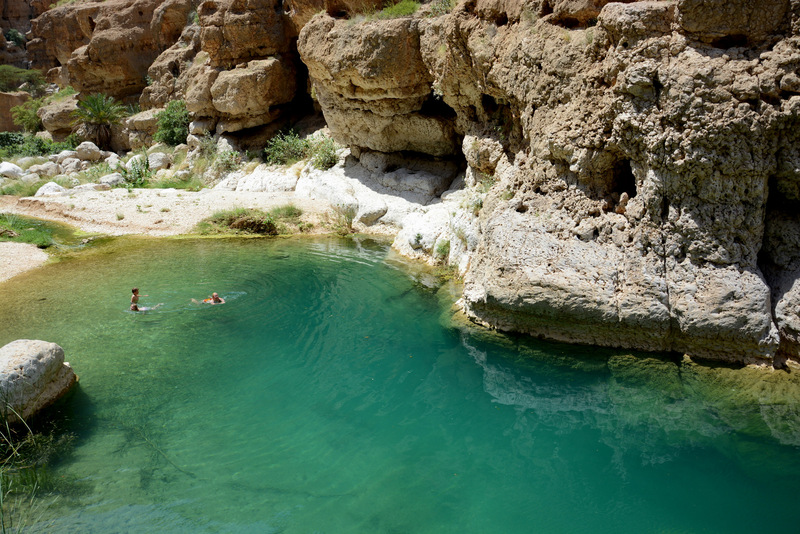 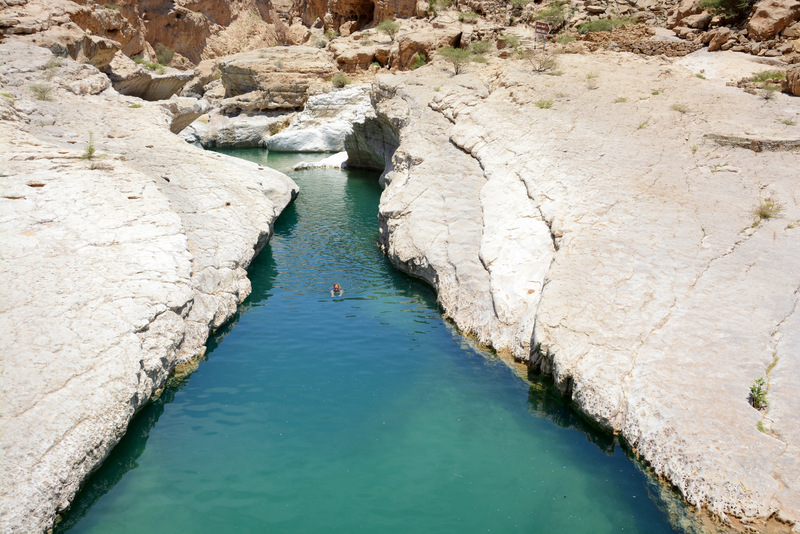 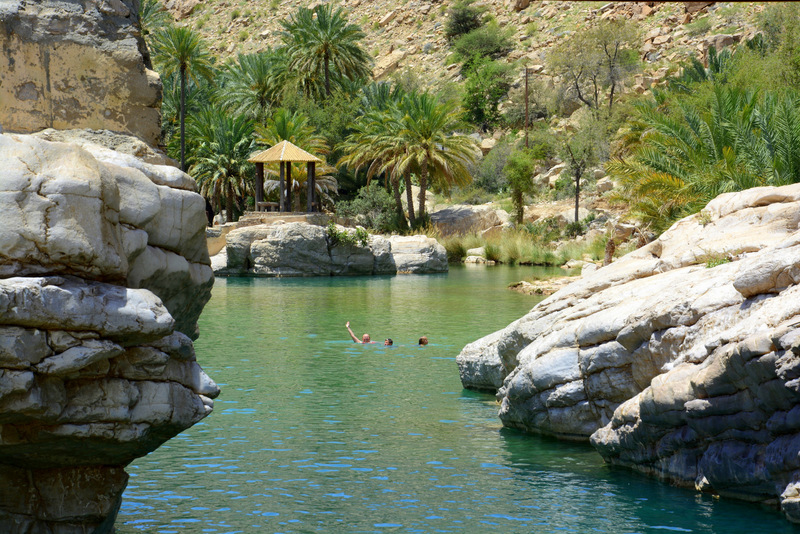 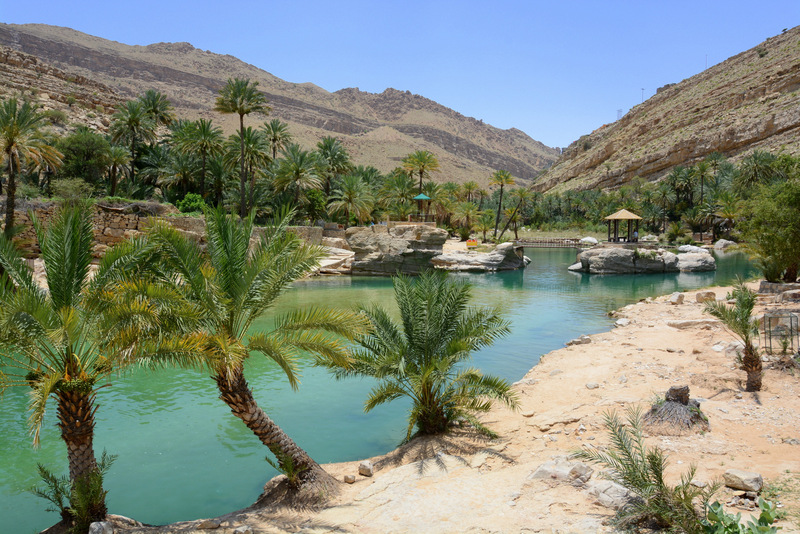 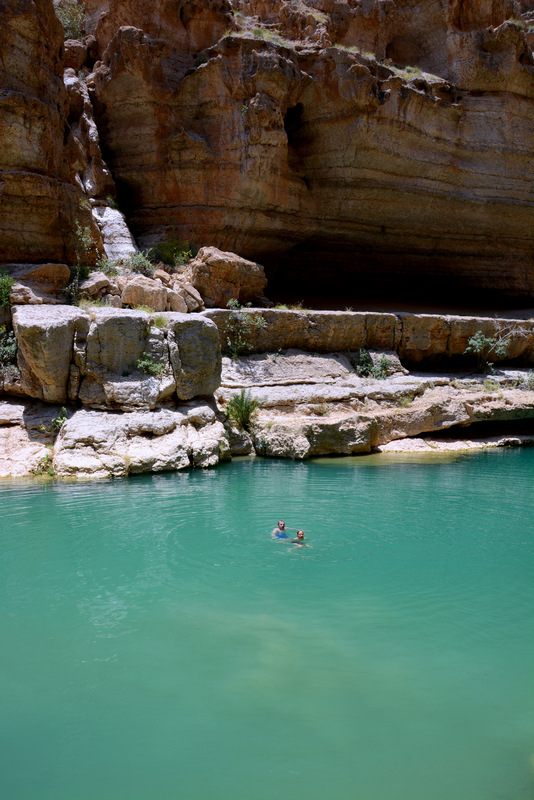 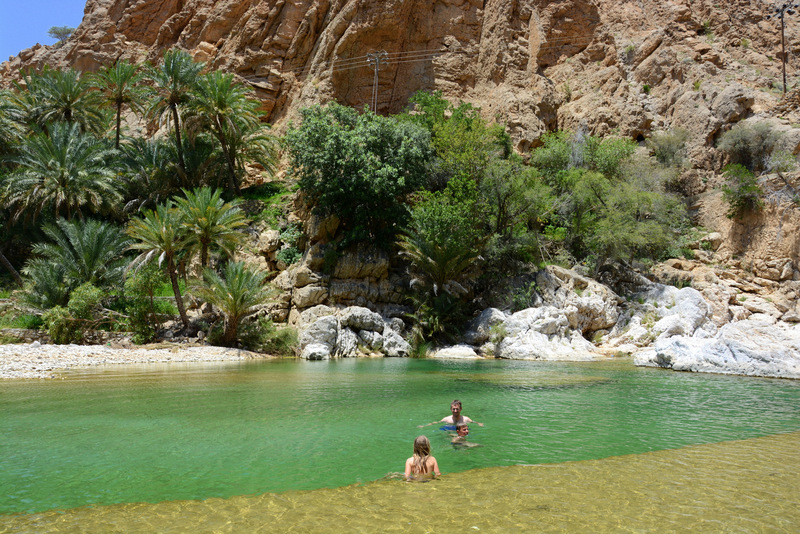 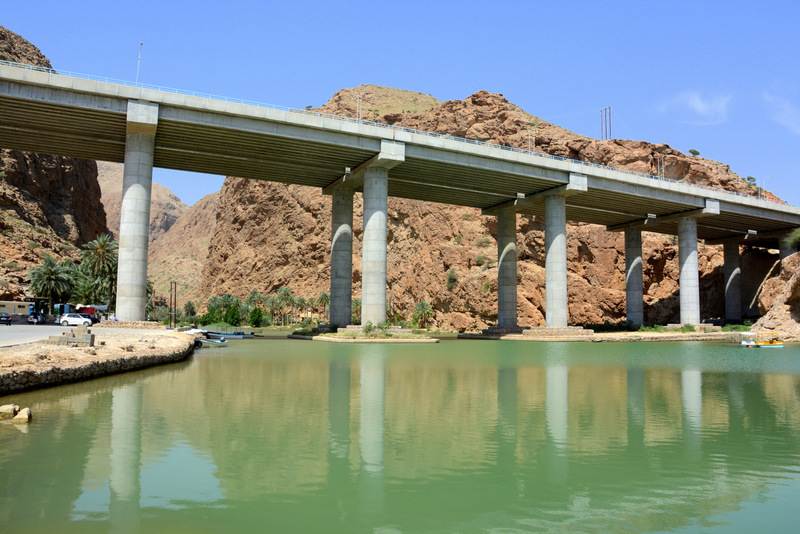 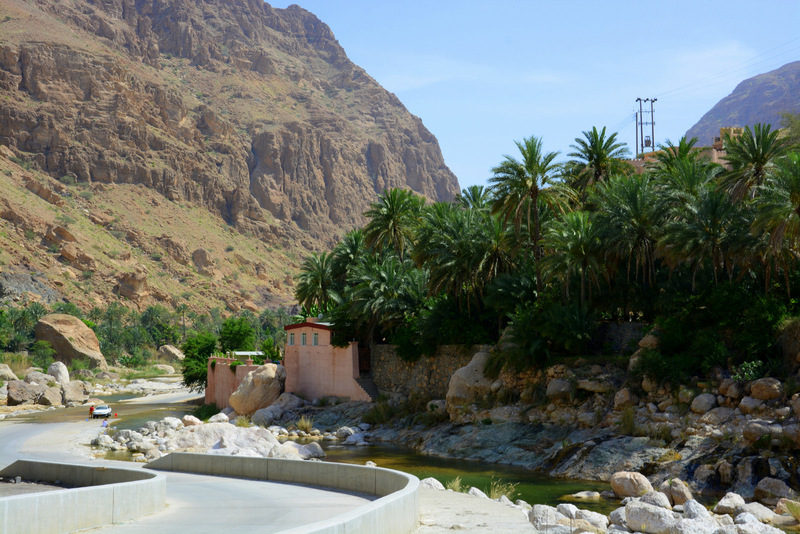 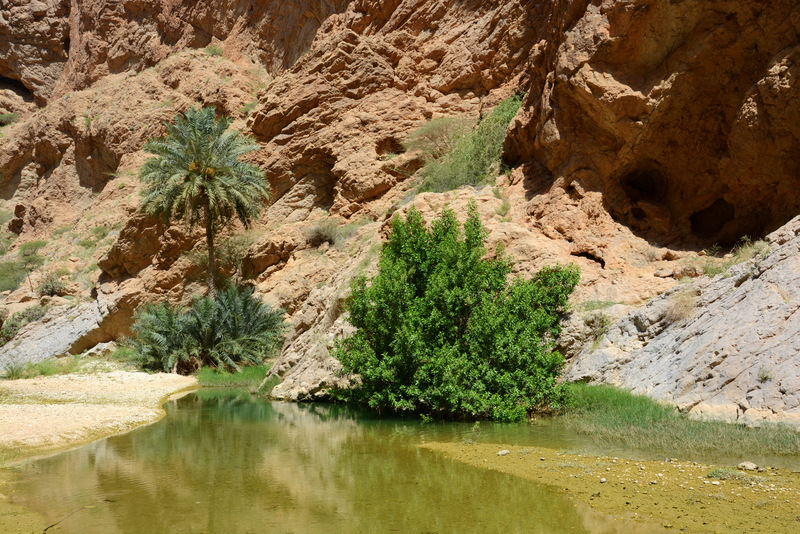 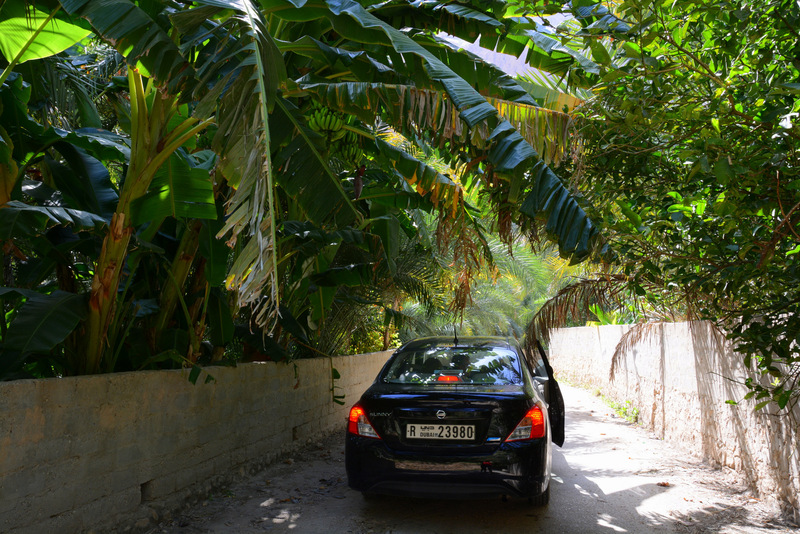 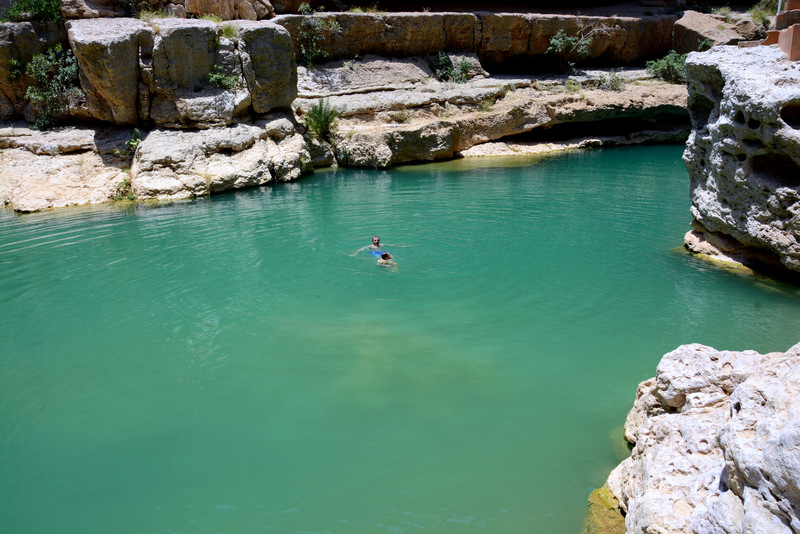 Idyllic green wadis, in which you can bathe, are true balsam for the soul and body and one of the peaks of Oman travel. 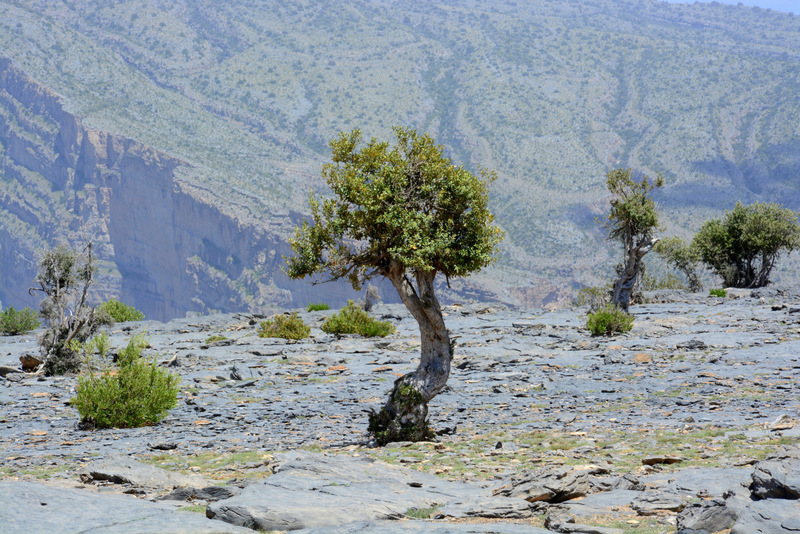 Nature has really good sense of beauty and creativity – have you notice that? 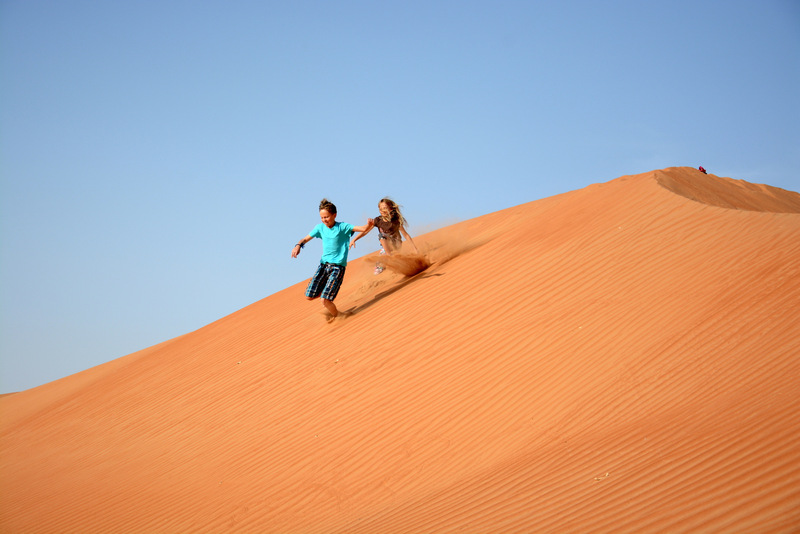 And the best, the most beautiful and the most genuine ranges for playing, creating or just being are in nature itself – forests, beaches, mountains or dunes… it isn´t important where – everywhere you can see how little we are and how wonderfully beautiful nature is. 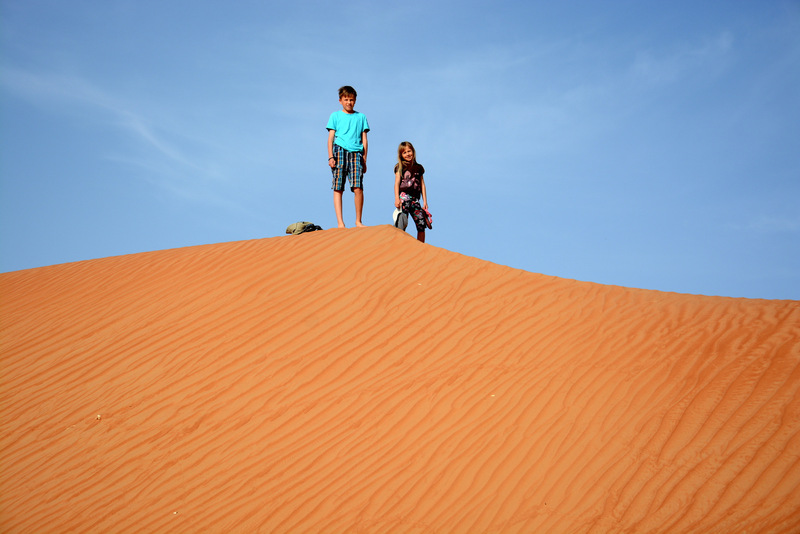 Dunes are paradise for photographers, the best sandpit for kids and great place to be with the silent part of us that only waits to be waken 🙂 . 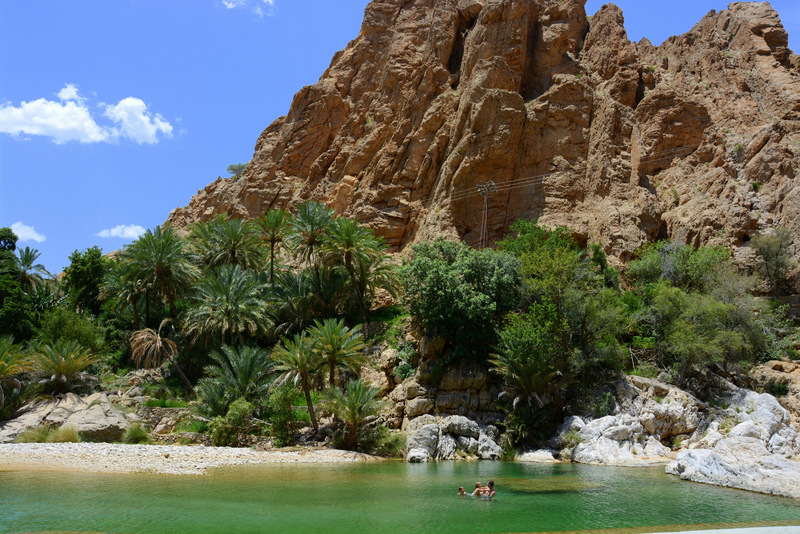 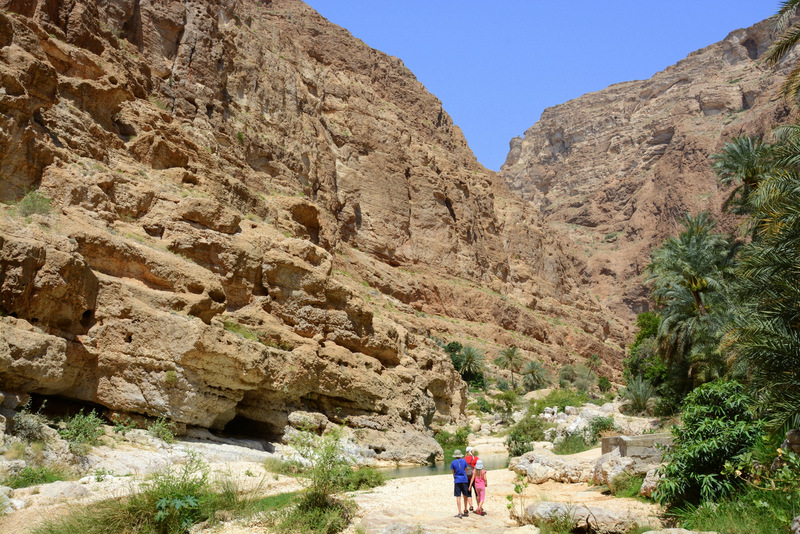 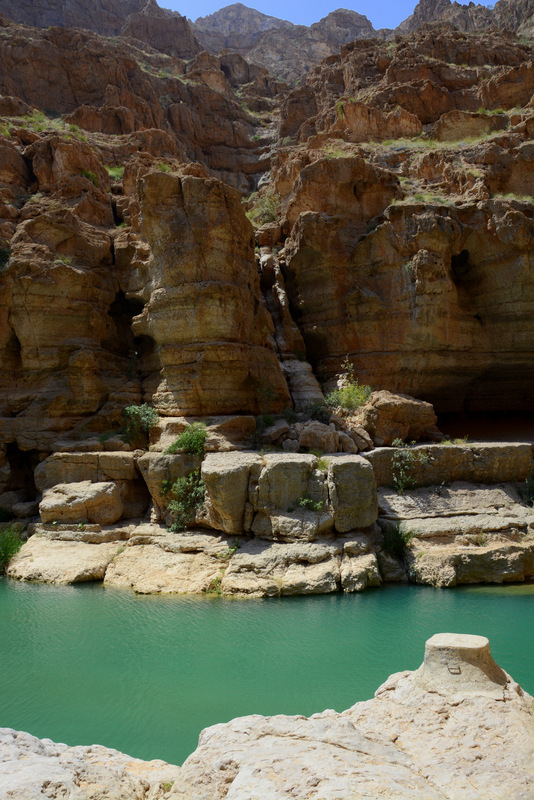 Wadi Tiwi and Wadi Shab are green ravines carved in hot brown and red rocks of Oman. 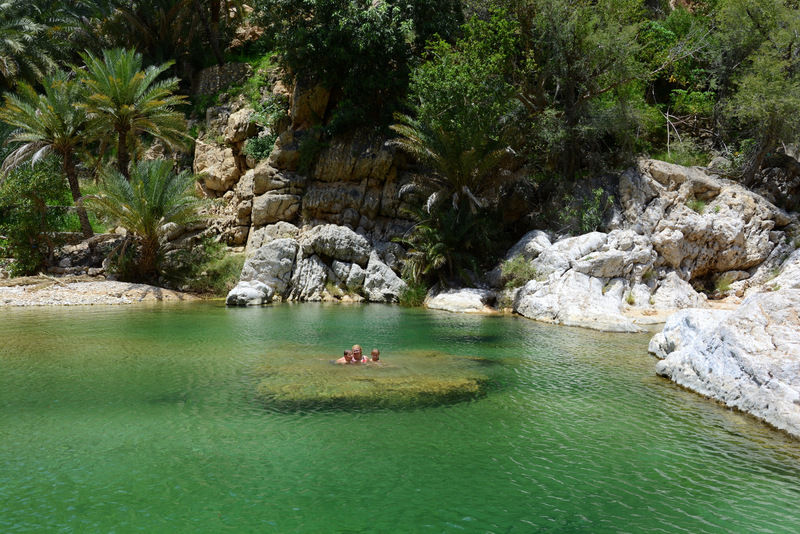 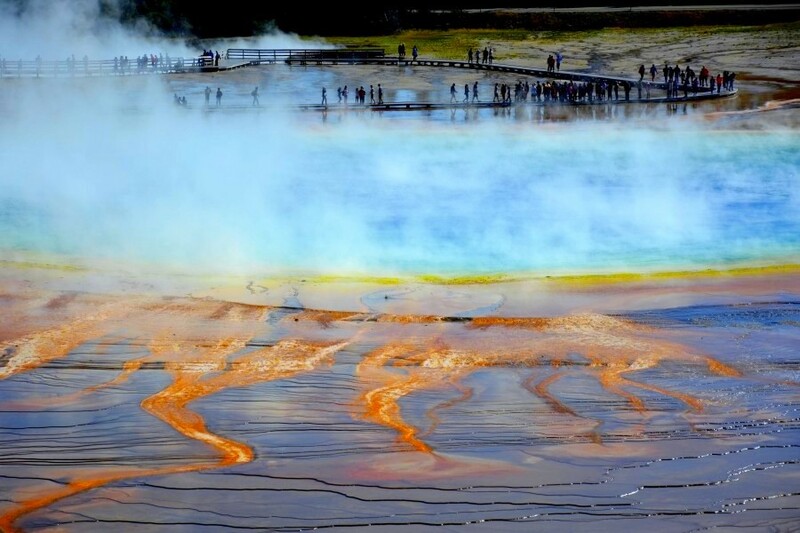 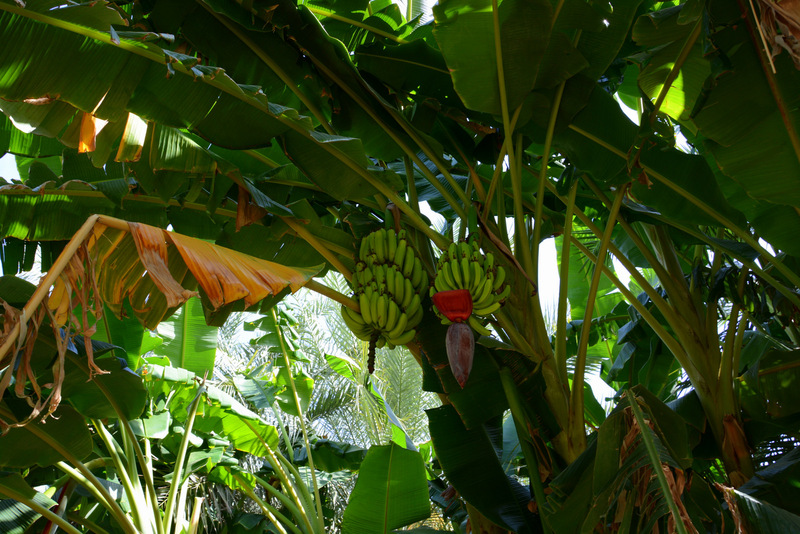 They are paradise for nature lovers, with their green pools, lakes and waterfalls. 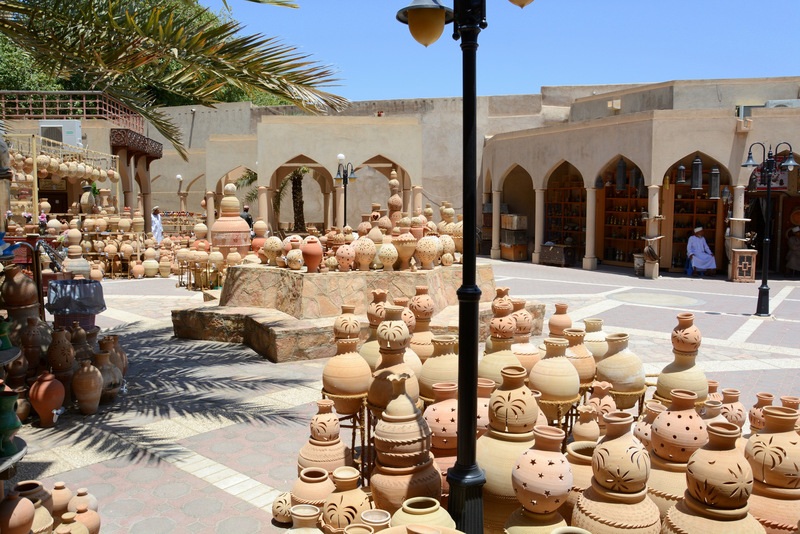 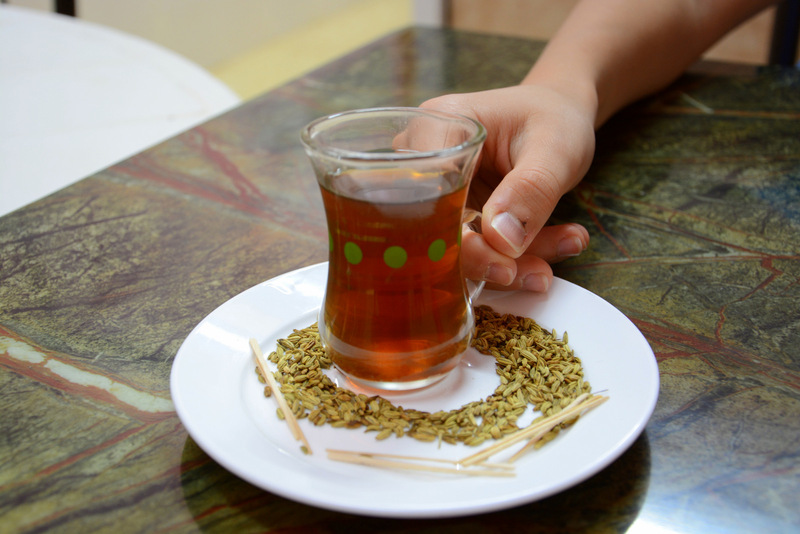 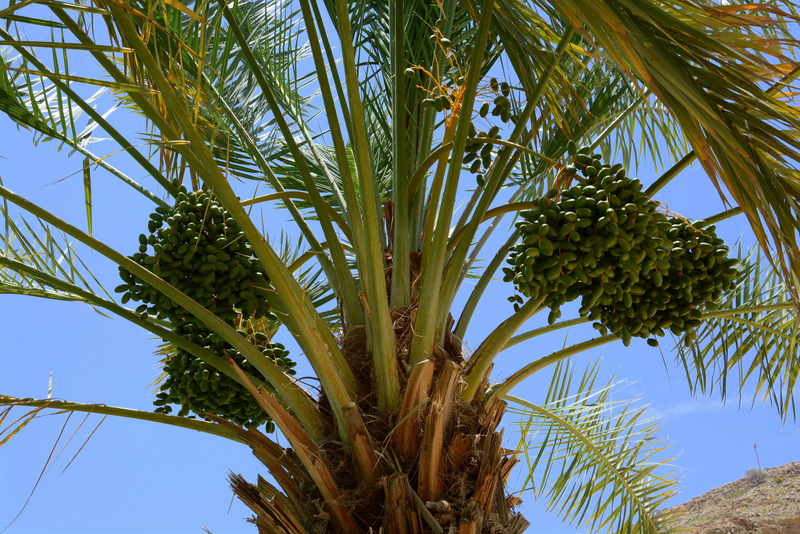 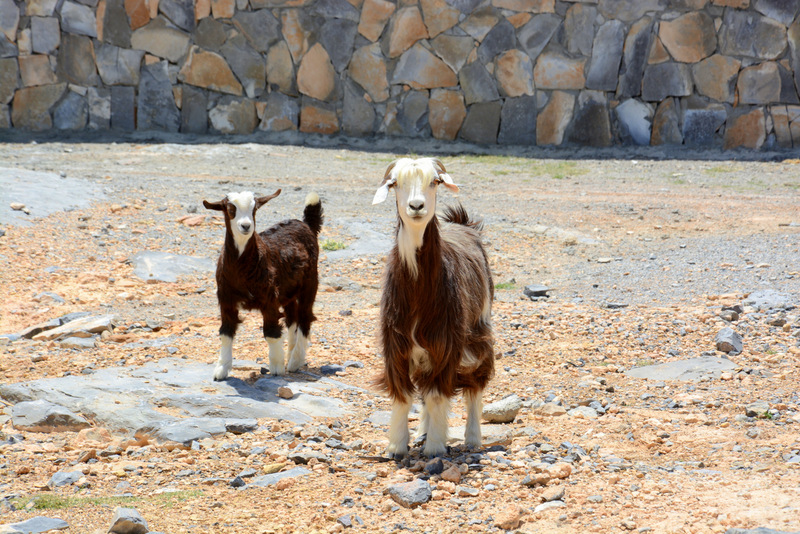 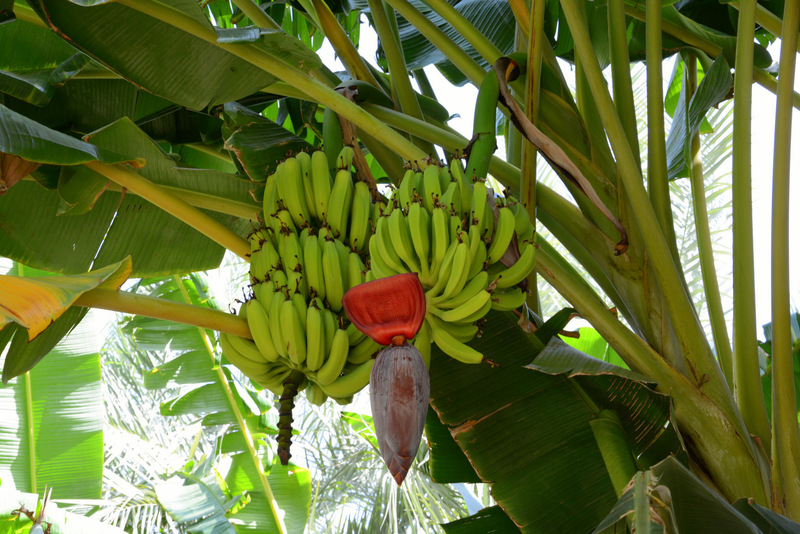 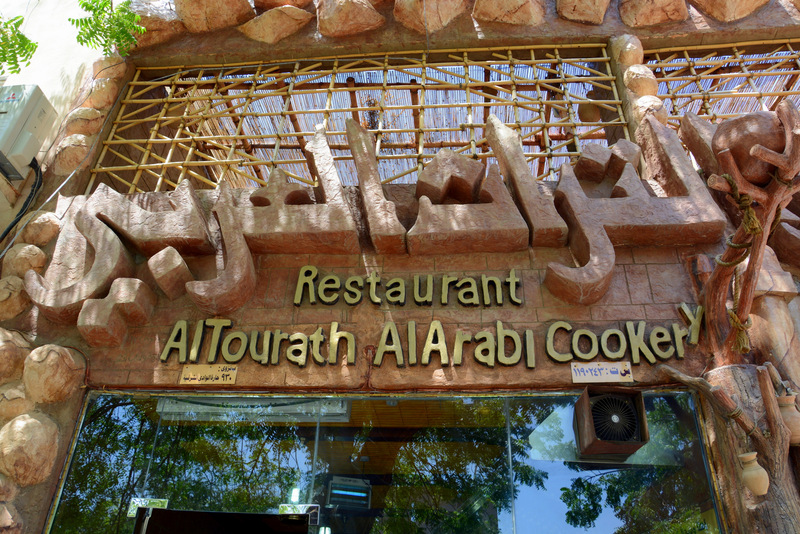 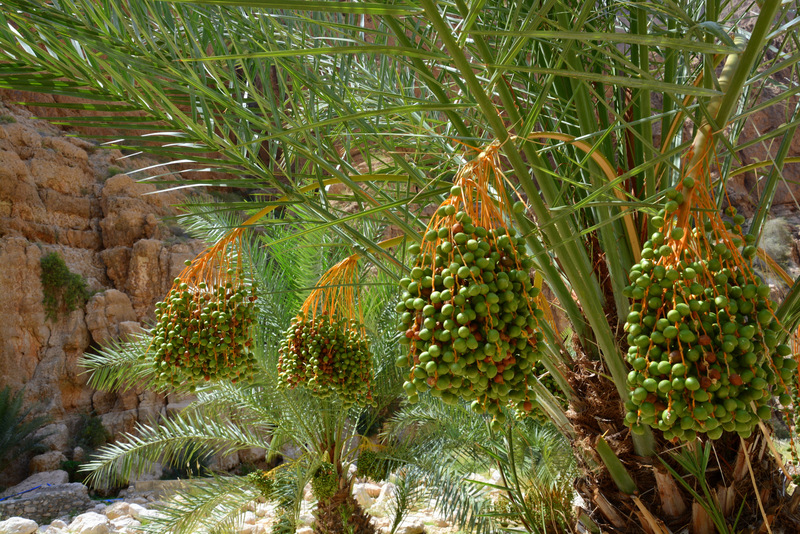 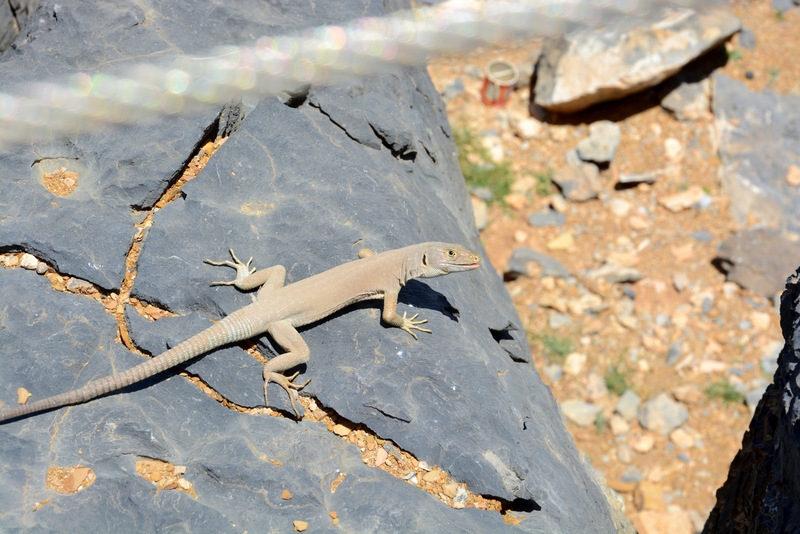 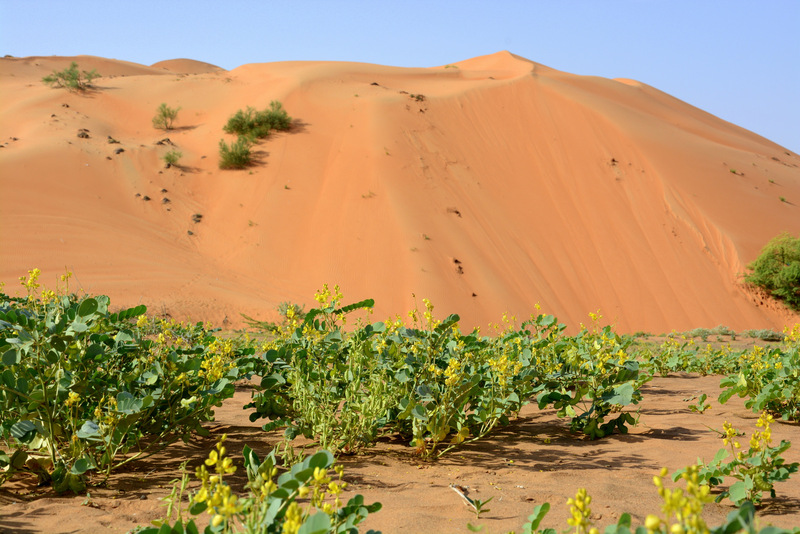 They are located by the road Sur – Muscat and you shouldn´t leave them out. 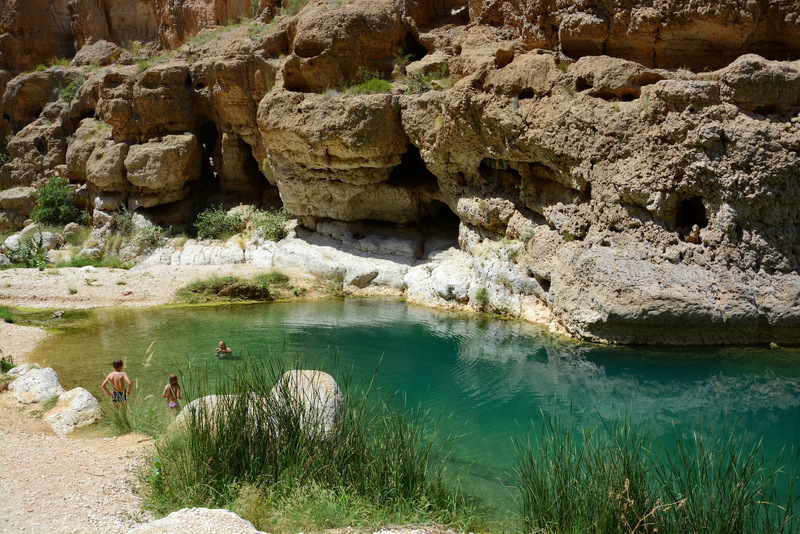 You should start exploring those ravines early in the morning as the sun is really hot and don´t forget to take enough water with you and something to cover your head. 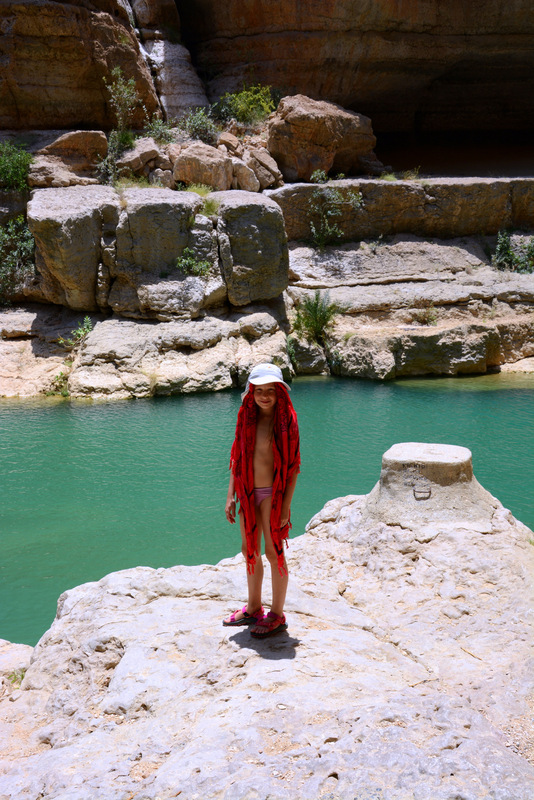 Luckily, the water in the pools is just the right temperature to cool down overheated bodies.